Ten drivers raced in the Japanese Grand Prix on March 9, 2018. 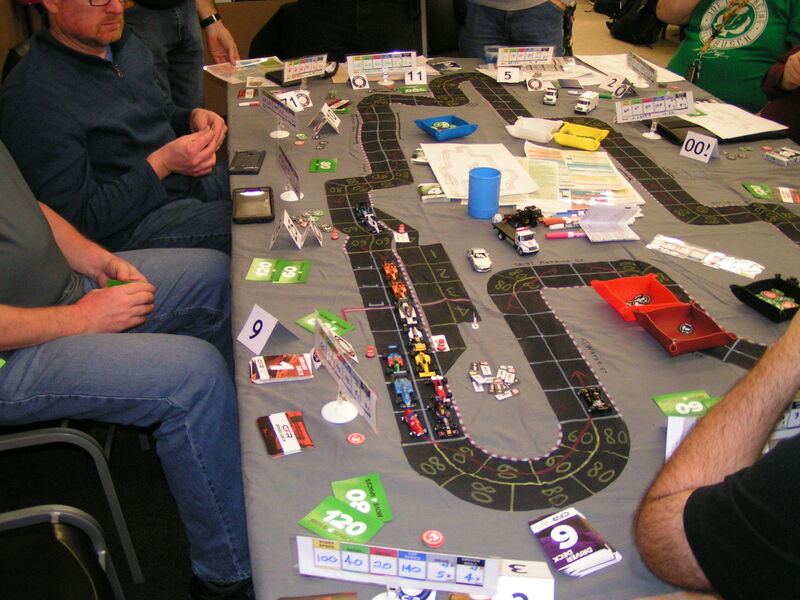 The race was on the Suzuka track, and the game was held at Imperium Games in Wixom, Michigan. In an extremely exciting race, Richard White bested the competition to win his first race of the CFR season. Gary Sturgeon and Gary Kempen took the other podium spots in 2nd and 3rd places, respectively. This means that Sturgeon now has clinched at least a tie for the 2017 CFR-Detroit championship. With one race remaining, Sturgeon has 41 points to Mike Cook’s 31 points. Cook could achieve a tie for the championship if he were to win the final race while at the same time Sturgeon earns zero points in that final race. 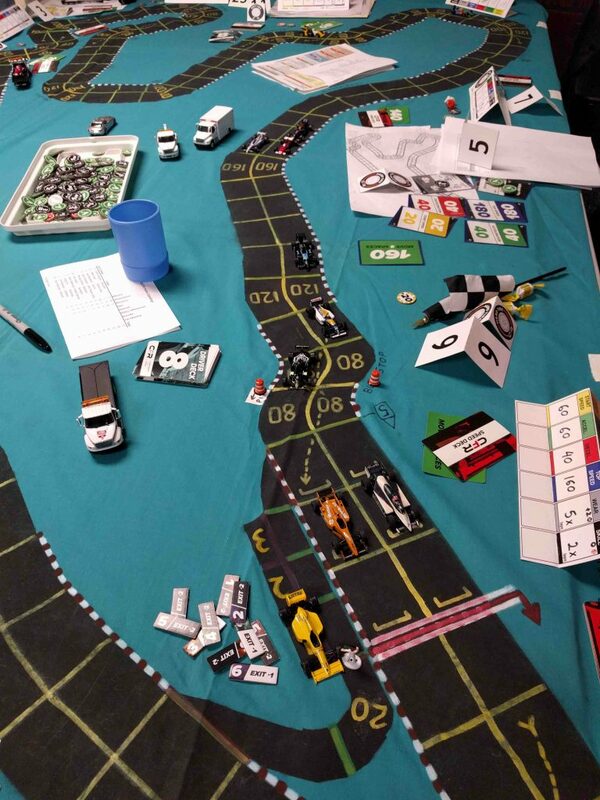 The bidding for pole position returned to saner levels as compared to recent races. Garry Kaluzny got his first pole position of the season by bidding 6.0 (3 wear + 6 skill). Richard White (3 wear + 1 skill) and Jim Robinson (2 wear + 3 skill) each bid 3.5, but White got the other front row spot with a better dice roll (74 to 06), so J. Robinson started 3rd. Points-leader Gary Sturgeon started 4th with a bid of 3.0 (0 wear + 6 skill). Brian Robinson bid 2.5 (0 wear + 5 skill) to start 5th. New driver Mike St. Peter (0 wear + 4 skill) and Jack Beckman (1 wear + 2 skill) each bid 2.0, with St. Peter starting 6th and Beckman 7th due to St. Peter’s better percentage dice roll (78 to 40). Mike Cook (0 wear + 2 skill) and Greg Lim (0 wear + 2 skill) each bid 1.0, with Cook starting 8th and Lim 9th due to a dice roll (98 to 85). Gary Kempen bid 0.0, so started in 10th place on the grid. The starting grid at Suzuka: Kaluzny (orange McLaren); White (blue & white Brabham); J. Robinson (blue, yellow & white Williams); Gary Sturgeon (black Lotus); B. Robinson (blue, yellow & white Williams); St. Peter (silver Mercedes); Beckman (red Ferrari); Cook (yellow Lotus); Lim (black & blue Motorola); Kempen (red Ferrari). At the start, White boosted his start speed to 80 mph, using a wear since he was on soft tires, thus taking the lead. Pole-sitter Kaluzny merely started at 60 mph since he was on hard tires and did not want to roll dice at the start of the race. Cook also boosted his start speed to 80 mph to jump from 8th to 6th, while B. Robinson dropped from 5th to 7th, even though he boosted his 20 mph start speed to 40 mph. The pack roars away! White takes the lead, then came Kaluzny, J. Robinson, Sturgeon, St. Peter, Cook, B. Robinson, Beckman, Kempen, and Lim. 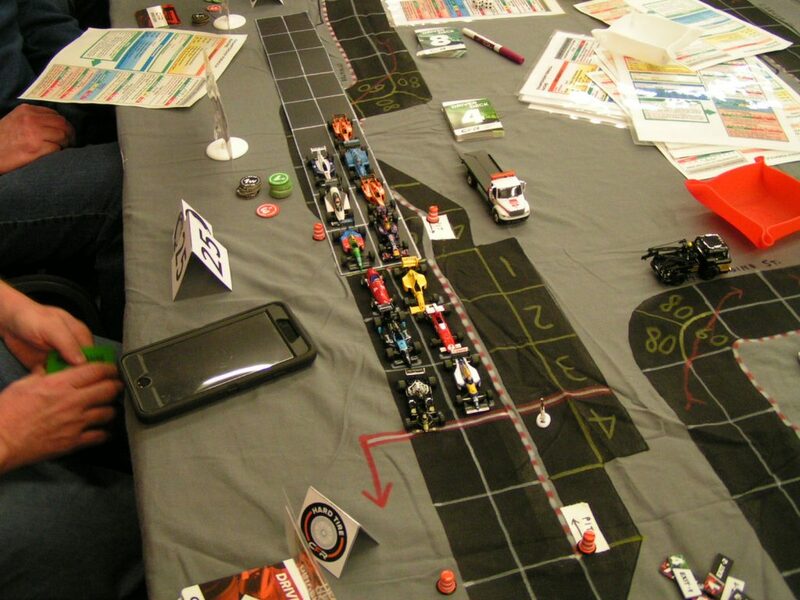 At the end of the starting straightaway and into the first two corners, White had pulled out a two-space lead, while J. Robinson ducked inside Kaluzny to take 2nd place. Into the first corners, and White’s leading Brabham is almost hidden behind the “4” sign. Lim’s Motorola car is already lagging behind Kempen’s Ferrari. 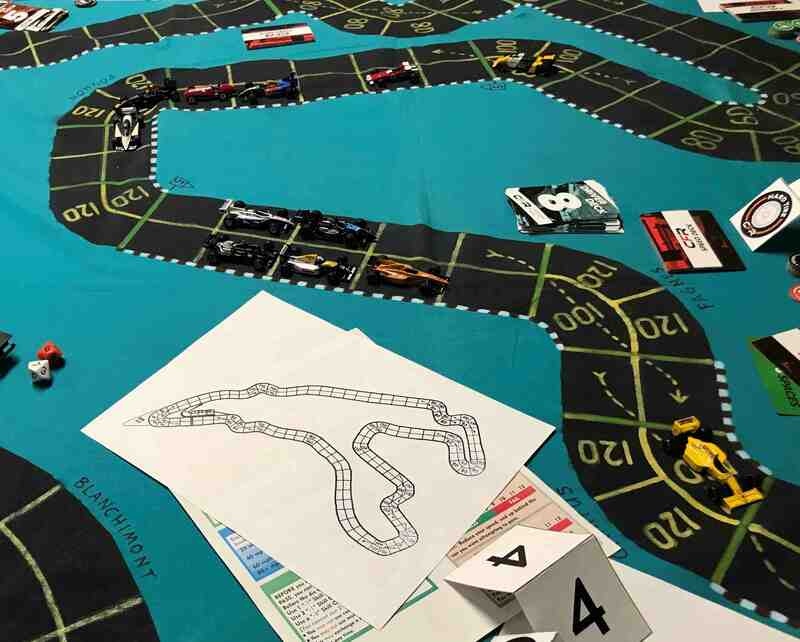 Through the “snake” curves on the Suzuka track, Kaluzny reclaimed 2nd place from J. Robinson, and Cook pulled alongside J. Robinson. Cook then passed J. Robinson and pulled alongside Kaluzny at the Degner 1 curve. Then coming up to the hairpin curve for the first time, the pack was back together. Through the hairpin the first time, and the pack has bunched up. 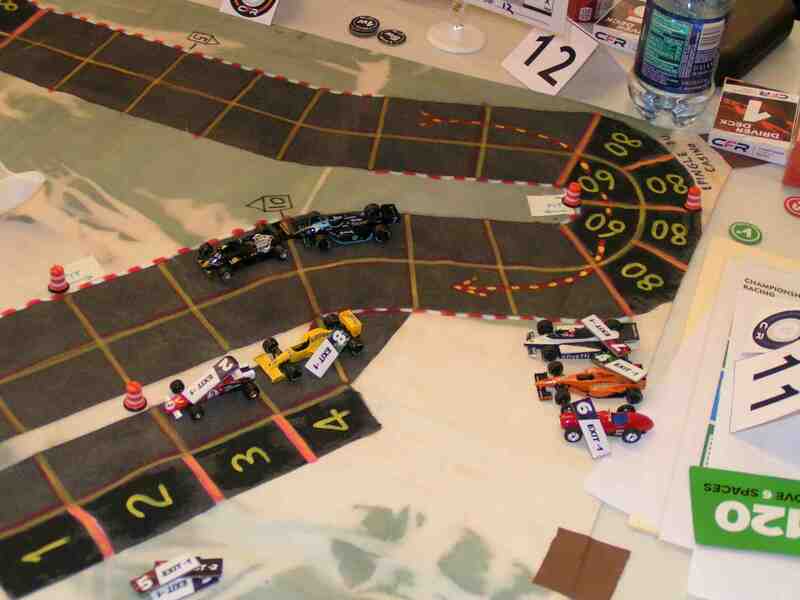 Richard White then zoomed away from the pack when he exited the hairpin curve. Jim Robinson made a daring forced pass of Mike Cook at the hairpin, also getting by Gary Sturgeon, thereby putting J. Robinson into 3rd place, behind Kaluzny’s 2nd place. Brian Robinson, meanwhile, had to burn a wear to slow from 80 mph to 60 mph, and got stuck behind Cook and Sturgeon in the hairpin. 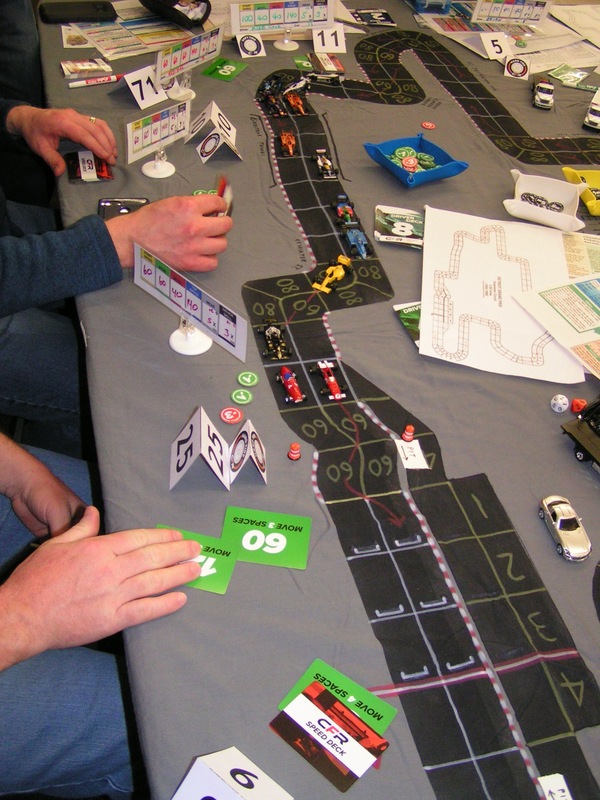 White (white and blue car just below the blue dice cup) takes a 4-space lead over Kaluzny; Kaluzny leads by 4 spaces over J. Robinson. White, Kaluzny, and J. Robinson maintained their running order over the bridge, while Sturgeon and Cook battled each other for 4th and 5th place. White leads over the bridge for the 1st time while Gary Sturgeon (left) and Jim Robinson (right) look on. 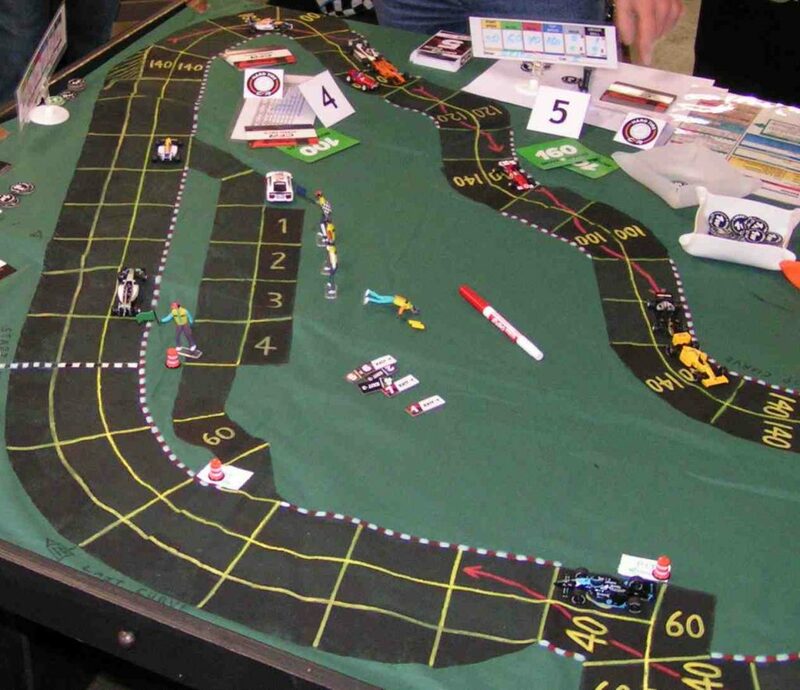 Garry Kaluzny had made a nice overlay for where the track crosses over itself, but he forgot that overlay at home; hence, the crude ad-hoc bridge overlay that appears in this picture was used instead. As White approached the chicane for the first time, he attempted to negotiate it at 120 mph, using 2 wears and rolling a chance dice roll. Although he used a -3 skill chit, he rolled a 10 and thus spun in the first space of the corner! This would allow the pack to close up on him. The yellow flag waves as White spins at the chicane. Gary Sturgeon and Jim Robinson look on. As White recovered from his spin, he was able to restart at 60 mph and then pulled into the pits. Kaluzny, running in 2nd, managed to make it through the chicane at 100 mph and then also pulled into the pits. White and Kaluzny have pulled into the pits; still on the track are Sturgeon, J. Robinson, Cook, B. Robinson, Beckman, St. Peter, Lim, and Kempen. 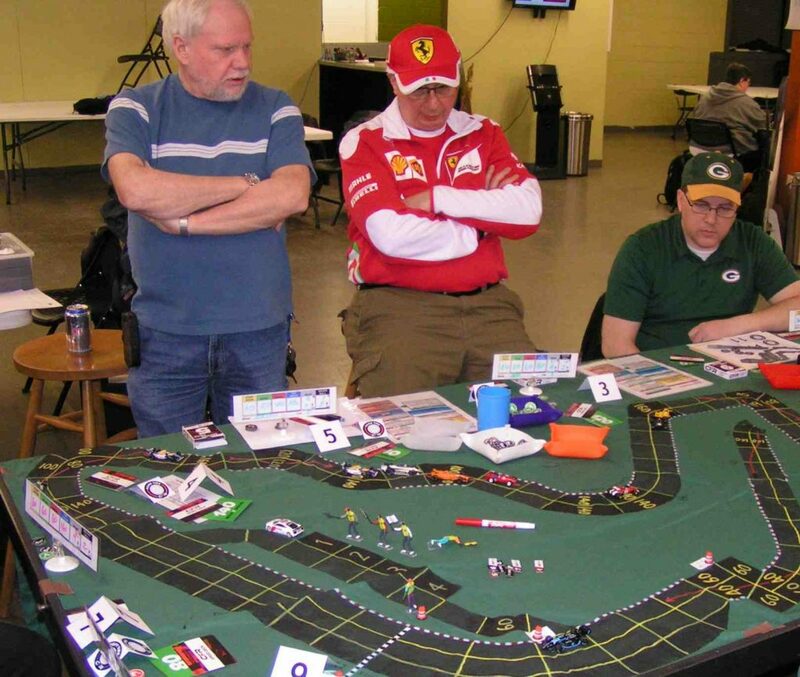 Gary Sturgeon got through the chicane safely to take the lead on the track, but then Jim Robinson spun in the chicane, and that caused Cook, B. Robinson, and Beckman to have to take evasive maneuvers to avoid the spinning Williams. 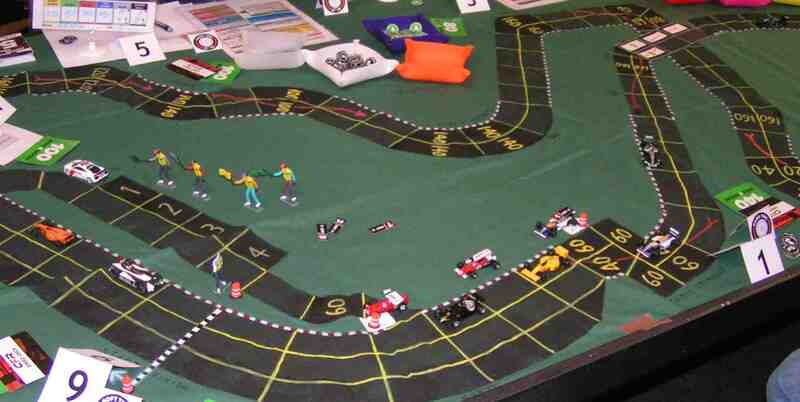 Jim Robinson spins in the chicane, causing chaos on the track! Sturgeon (black Lotus) takes the lead on the track as White and Kaluzny are in the pits. 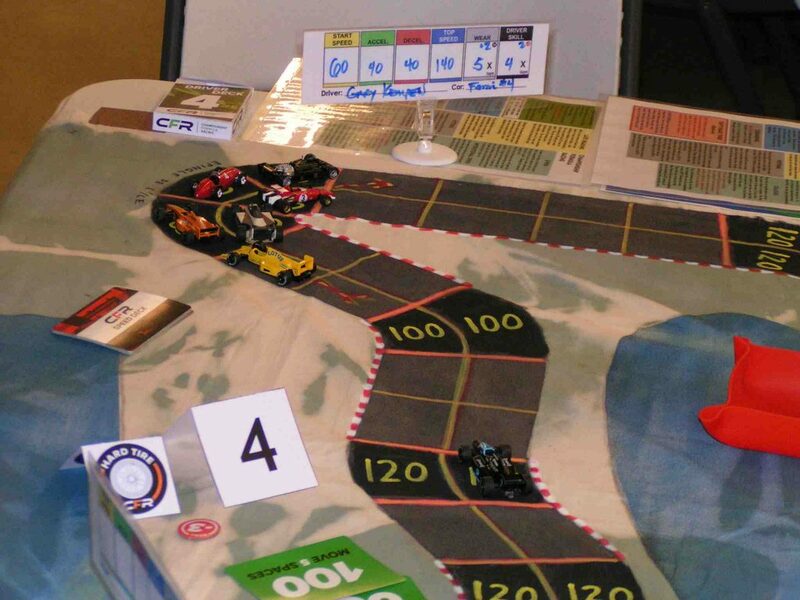 As Cook exited the chicane, he pulled alongside Sturgeon as they crossed over the start/finish line to complete the 1st lap. Brian Robinson and Mike St. Peter pulled into the pits, and White and Kaluzny came back onto the track alongside Jim Robinson as Robinson exited the chicane after starting at 40 mph after his spin. White switched from soft to hard tires while Kaluzny changed from hard to soft tires. As Lim entered the chicane, he became the 3rd car to spin in that same spot. Kempen then successfully made a forced pass to get by Lim’s spinning car and thus got to the last numbered space in the chicane and so Kempen could accelerate on his next move. Sturgeon and Cook complete the 1st lap; B. Robinson and St. Peter have entered the pits; White and Kaluzny have exited the pits. Lim has just spun in the chicane. As Brian Robinson exited the pits, he had changed from soft to hard tires, while St. Peter and Lim had switched from hard to soft tires. 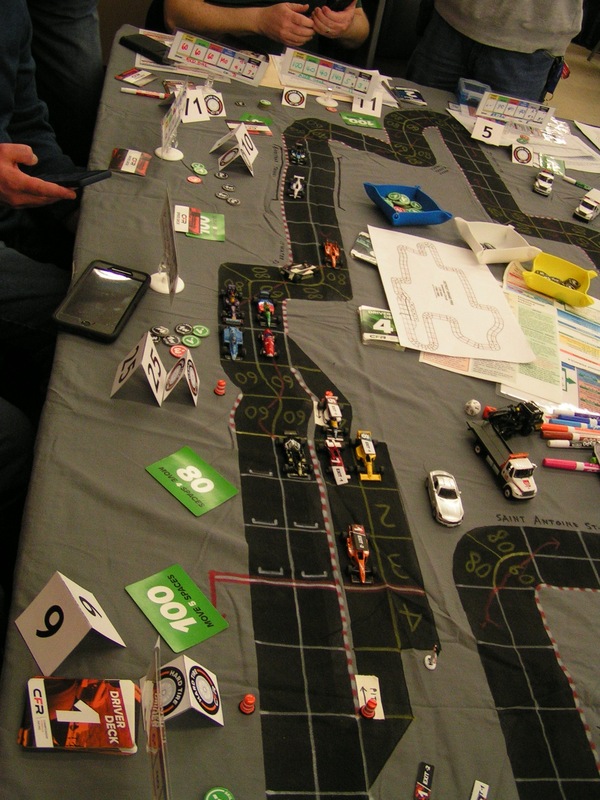 The official running order after the completion of the 1st lap was: Sturgeon (+3); Cook (+6); Beckman (+4); Kaluzny (-3); White (-3); Kempen (+4); J. Robinson (-4); B. Robinson (-3); St. Peter (-3); and Lim (-1). The numbers in parentheses indicate how many positions a driver either gained (+) or lost (-) from their starting position. Cook (yellow Lotus) takes the lead from Sturgeon through the “snake” corners. Following behind are Beckman, Kaluzny, Kempen, White, J. Robinson, B. Robinson, St. Peter, and Lim. Through the “snake” curves the 2nd time around, Kempen passed Kaluzny. Brian Robinson (blue shirt), Jack Beckman (red Ferrari shirt), and Mike Cook (green shirt) watch the race. Cook’s yellow Lotus leads Sturgeon’s black Lotus (near the “3” sign). 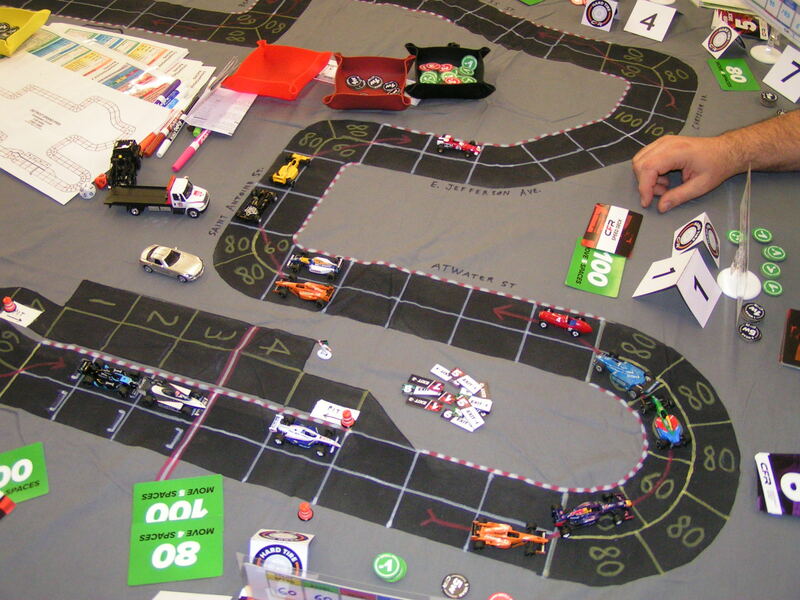 Cook held the lead through the hairpin turn, but then Sturgeon out-dragged Cook to take the lead at the 200R curve. Sturgeon retakes the lead from Cook through the 200R curve. Beckman is 3rd, Kaluzny has retaken 4th, White is 5th, Kempen 6th, J. Robinson 7th, St. Peter and B. Robinson are 8th and 9th, and Lim is in 10th, 11 spaces behind. Kempen then put on another burst of speed to pass both White and then Kaluzny, pulling up alongside Beckman through the Spoon Curve. Kempen (#4 Ferrari) retakes 4th at the Spoon Curve. Sturgeon and Cook are side by side in 1st and 2nd (near the “2” sign). Kempen then rolled dice to increase his top speed to 180 mph coming out of the Spoon Curve, and proceeded to pass his Ferrari teammate Beckman along the Backstretch. Kempen takes 3rd place from Beckman; St. Peter has spun in the Spoon Curve while Jim Robinson goes around St. Peter. But Kempen pushed his luck too far. While again attempting to push his top speed to 180 mph while going over the bridge, he rolled a “10” on an unmodified top speed roll, and that damaged his car’s top speed. He only got to move 160 mph on this turn, and his future top speed was only 140 mph (and with another entire lap yet to race). As the leaders Sturgeon and Cook pulled into the pits to change from hard to soft tires for their last lap, Kempen, Kaluzny, Beckman, and White were all bunched up at the chicane. The two Williams cars of J. Robinson and B. Robinson were a ways behind, then farther back was St. Peter, and finally came Lim who was about 1/4 lap behind. Sturgeon and Cook make their pit stops as the rest of pack closes up on them. As the other cars came through the chicane, the Ferraris of both Kempen and Beckman made their pit stops, both switching from hard to soft tires for their final lap. Kaluzny and White stayed on the track. After crossing the start/finish line, White gained 3 wear as he was on hard tires; Kaluzny was on soft tires and so gained no extra wear. Jim Robinson had to make an unmodified deceleration roll to get down to 60 mph to get through the chicane as he was out of wear; he then pulled into the pits. Kaluzny and White take over the lead as most of the other cars have either just pulled into the pits, or have just been placed back on the track after exiting the pits. Beckman, Kempen, and J. Robinson are the cars off the track in the pits, while the Loti of Sturgeon and Cook are on the track. B. Robinson’s Williams is in the chicane, St. Peter is approaching the chicane, while Lim’s car is in the upper right corner of the picture. The cars of Mike St. Peter and Greg Lim made pit stops, while Brian Robinson stayed on the track. After all cars had cycled through the pits at the end of the 2nd lap, the official running order was Kaluzny (0), White (0), Sturgeon (+1), Cook (+4), B. Robinson (0), Kempen (+4), Beckman (0), J. Robinson (-5), St. Peter (-3), and Lim (-1). Kaluzny held off White until the Degner 1 and Degner 2 corners, and then White passed Kaluzny to take the lead. 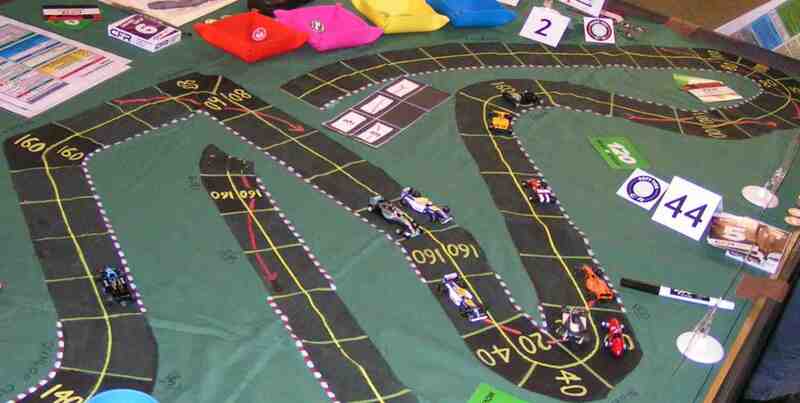 Going into the hairpin, Sturgeon and Cook had caught up to the two front-runners. White leads into the hairpin for the last time. 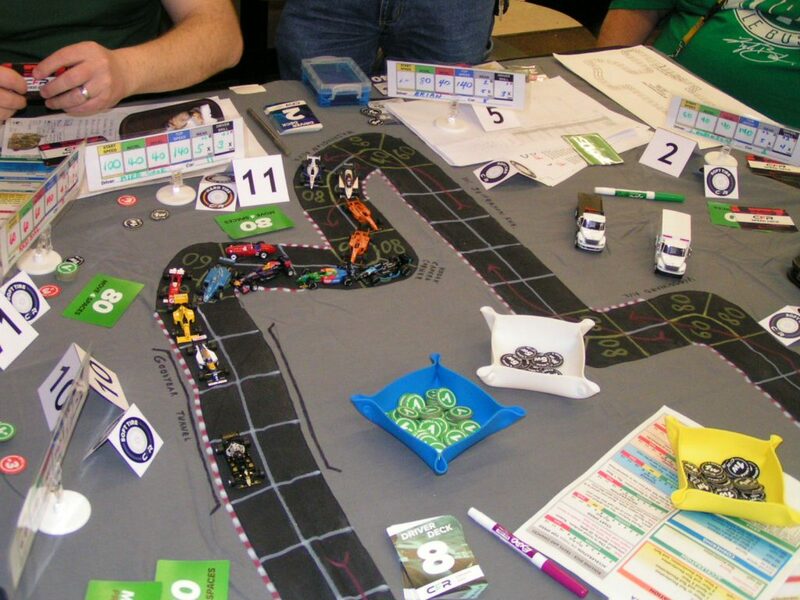 Going through the hairpin for the last time, White, Kaluzny, and Sturgeon were running nose-to-tail while Cook was balked in the hairpin and got stuck in the hairpin for an extra turn. Kempen then passed Cook for 4th place upon exiting the hairpin. White holds the lead heading into the Spoon Curve. Kaluzny, Sturgeon, Kempen, Cook, Beckman, B. Robinson, J. Robinson, and St. Peter trail behind. Coming out of the Spoon Curve for the last time, Kaluzny tried to over-rev his engine to 180 mph. He successfully made an unmodified over-acceleration roll (to accelerate by 60 mph), but then failed the top speed roll. He moved 160 mph, and had his top speed reduced to 140 mph thereafter. Kaluzny then made an unmodified top speed roll to go 160 mph through the 130R corner just past the bridge, all in an attempt to stay ahead of Sturgeon and thus keep a mathematical chance of winning the championship alive. Kaluzny knew if he finished behind Sturgeon that he would be eliminated from any chance of the points championship. 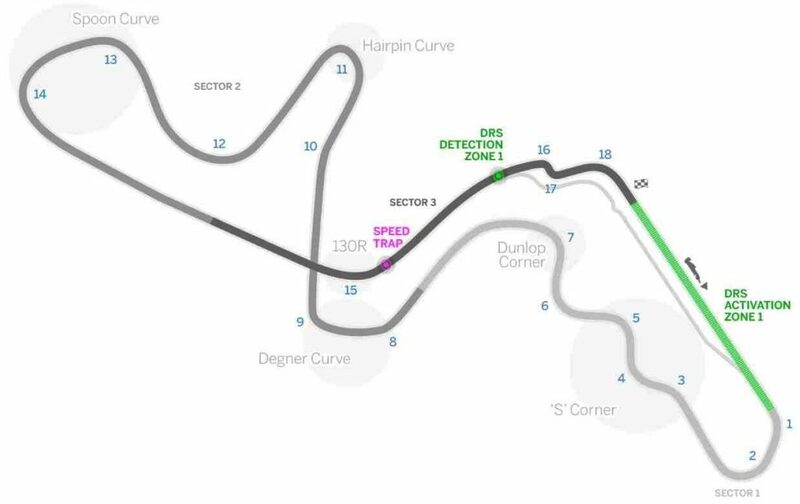 While White went 100 mph into the chicane, thus ending on the final space of the chicane and so would be able to accelerate on his next move, both Kaluzny and Sturgeon plotted 120 mph. They were both immediately behind White, and Kaluzny got to move first by virtue of being closer to the inside of the track relative to the next corner. 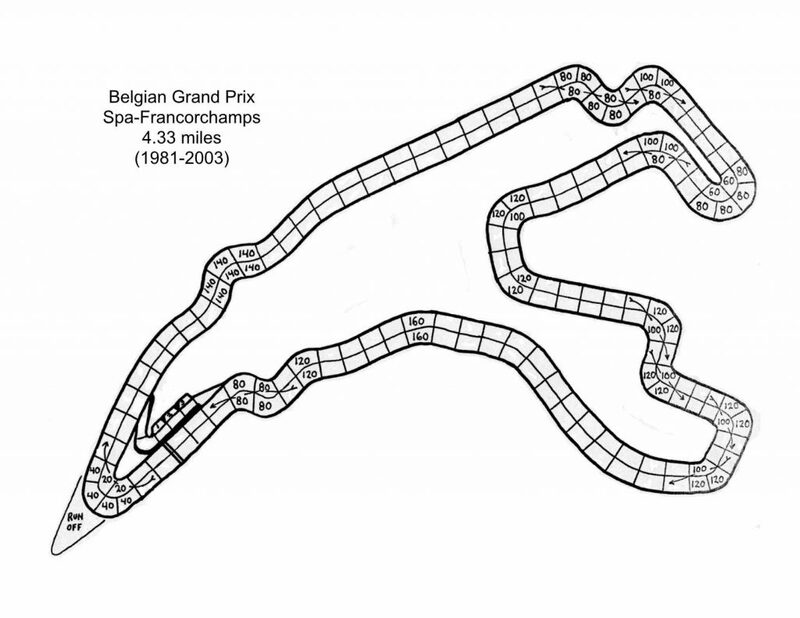 (The red-and-white striped lines around the track indicate which side of the track is the inside at that part of the track.) Kaluzny had to roll an unmodified deceleration roll, though, and failed the roll. He then had to use 1 of his last 2 wears to slow down to 100 mph. Kaluzny then used his last wear and rolled an unmodified chance. He rolled a “9” and spun in the chicane. Sturgeon went around the outside of the chicane at 120 mph, using 3 wears as he was on soft tires. Kaluzny spins in the chicane, while White and Sturgeon make it through safely. Mike Cook (left) and Gary Sturgeon (right) look on. 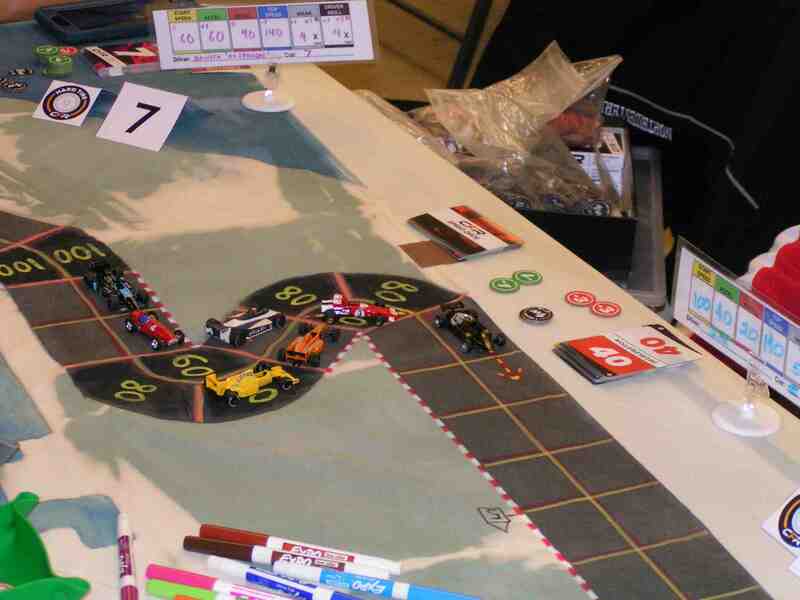 Richard White (+1) then motored across the finish line to take the checkered flag by 4 spaces over Sturgeon’s (+2) 2nd place. It was White’s first victory of the CFR-Detroit 2017 season. (White had previously won 16 races in the old Advanced Speed Circuit series in the late 1980s through the early 1990s.) Meanwhile, Kaluzny recovered from his spin by going 40 mph, just exiting the chicane. Kempen was barreling through the chicane at 80 mph and was running up Kaluzny’s tailpipe. Cook was also going 80 mph, but got stuck in the chicane. Richard White takes the checkered flag! But the excitement wasn’t yet over. Although Kaluzny made an unmodified acceleration roll to go to 100 mph and reach the finish line on his move, Kempen (+7) used his 60 mph acceleration to get to 140 mph, thus sling-shotting around Kaluzny to take 3rd place, relegating Kaluzny (-3) to 4th. Cook (+3) continued on to finish in 5th place. Beckman then made an unmodified roll to slow for the chicane, but spun when he rolled an unmodified chance. Brian Robinson had to go around the outside of the chicane to avoid Beckman’s spinning Ferrari. B. Robinson rolled a chance, using a -3 skill marker. But he too spun. Sturgeon takes 2nd, Kempen nips Kaluzny for 3rd, Cook is 4th, and Beckman and B. Robinson have spun in the chicane. 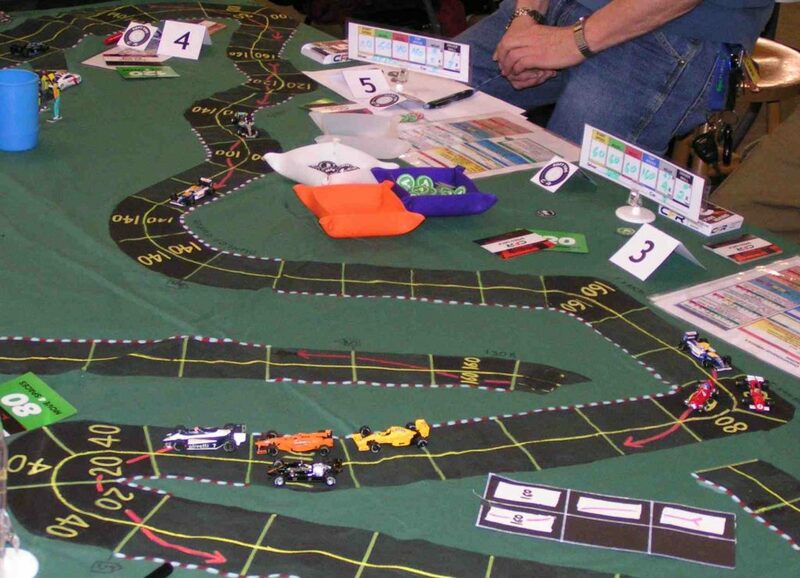 The road marshal with the yellow flag has passed out with fatigue, what with having to wave that yellow flag for multiple spinning cars at that chicane during the race! This is where Brian Robinson’s low 20 mph start speed bit him, as he could only start at 20 mph while trying to recover from spinning in the chicane, and that left him in the chicane for another turn. (Cars that re-start after a spin can only move the slower of their start speed or acceleration.) Beckman (+1) recovered from his spin to take 6th place and get the last point available. Positions 7 through 10 were: J. Robinson (-4); St. Peter (-2); B. Robinson (-4); and Lim (-1). The last four drivers did not receive any points for their efforts in this race. Podium finishers: White; Sturgeon; and Kempen. 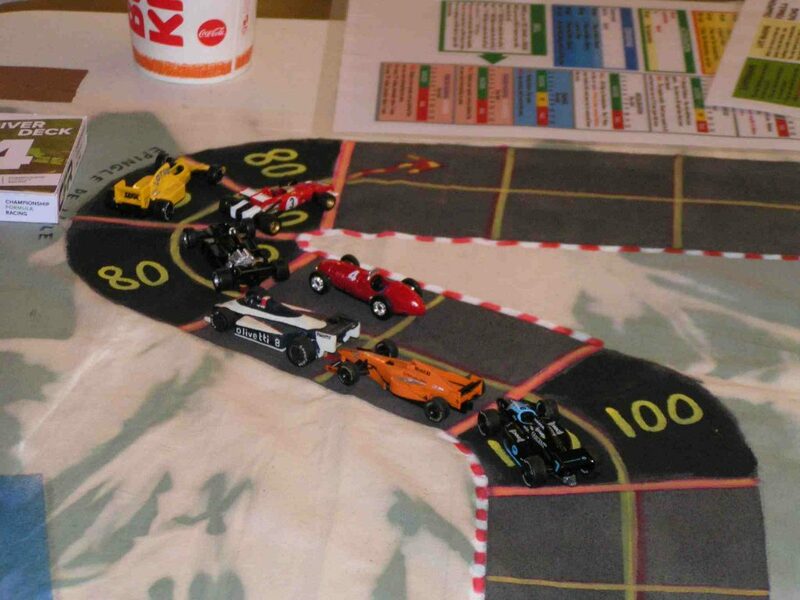 The points awarded at the Japanese Grand Prix: White 10; Sturgeon 6; Kempen 4; Kaluzny 3; Cook 2; and Beckman 1. The 8th and final race of the 2017 CFR-Detroit racing series will be on Friday, April 13 (“Yikes! Friday the 13th done come on a Friday this month!” — so says Churchy LaFemme). 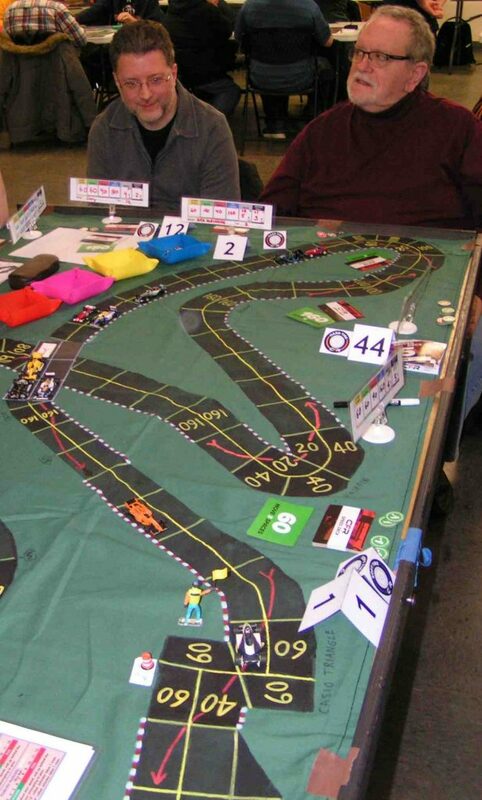 The race will be at Pandemonium Games & Hobbies at 6033 Middlebelt Rd. in Garden City, Michigan. It is on the west side of Middlebelt Rd., just a few blocks north of Ford Rd. The race will begin at 7:00 pm, so once again we ask all drivers to try to arrive around 6:30 pm in order to have enough time to get your car set up for the race. We will begin bidding for starting positions at 6:55 pm. Only seven drivers competed at the Canadian Grand Prix on February 16, 2018, using the Championship Formula Racing rules. Gary Sturgeon won his 2nd consecutive race after starting 4th on the grid. Jack Beckman (2nd) and Richard White (3rd) were the other podium finishers. 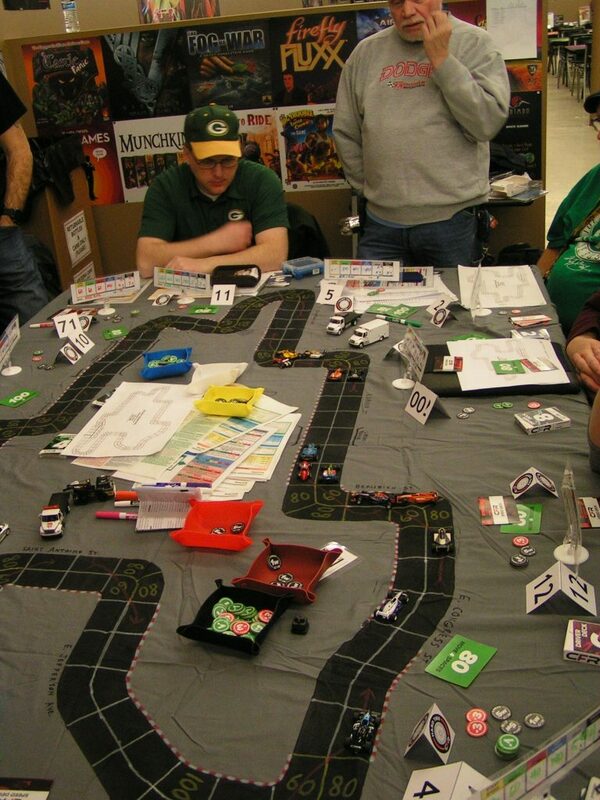 This race was held at the Guild of Blades game store in Clawson, Michigan. It had originally been scheduled for February 9, but was postponed a week due to an unusually heavy snowfall on the 9th. 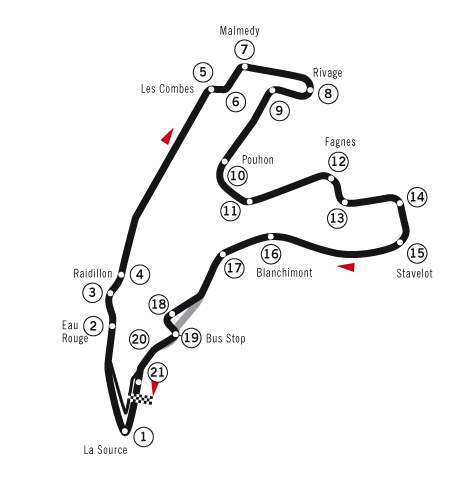 The race was on the Gilles Villeneuve circuit from Montreal, Canada. 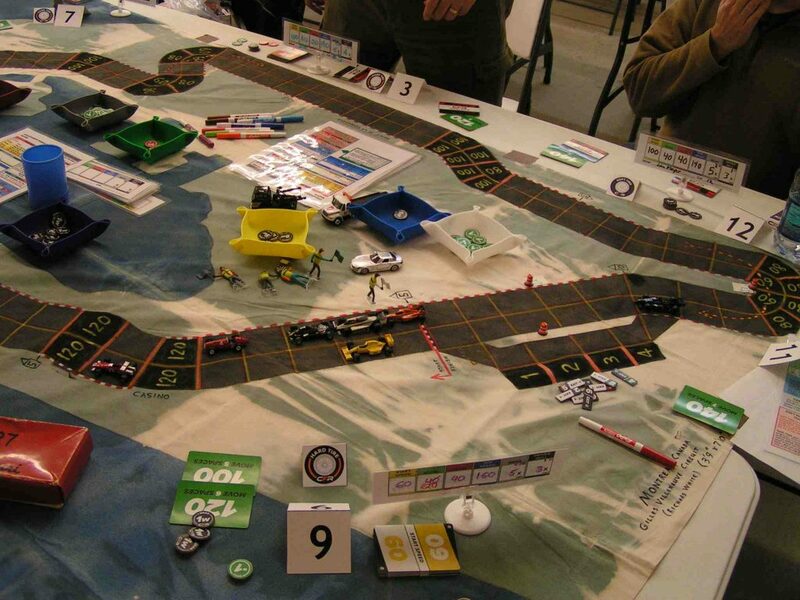 The CFR-Detroit race series is now averaging 9.8 drivers per race (through six races). 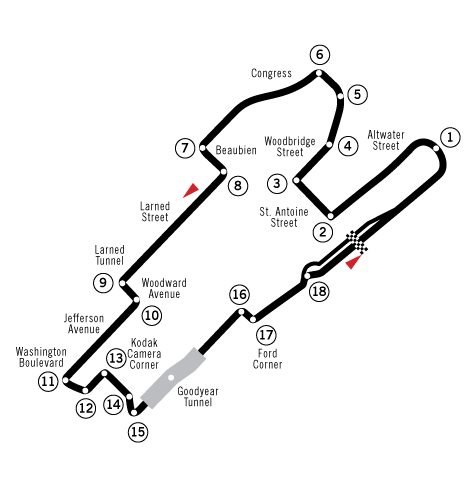 The Gilles Villeneuve circuit of Montreal, Canada, as configured from 1978 to 1986. 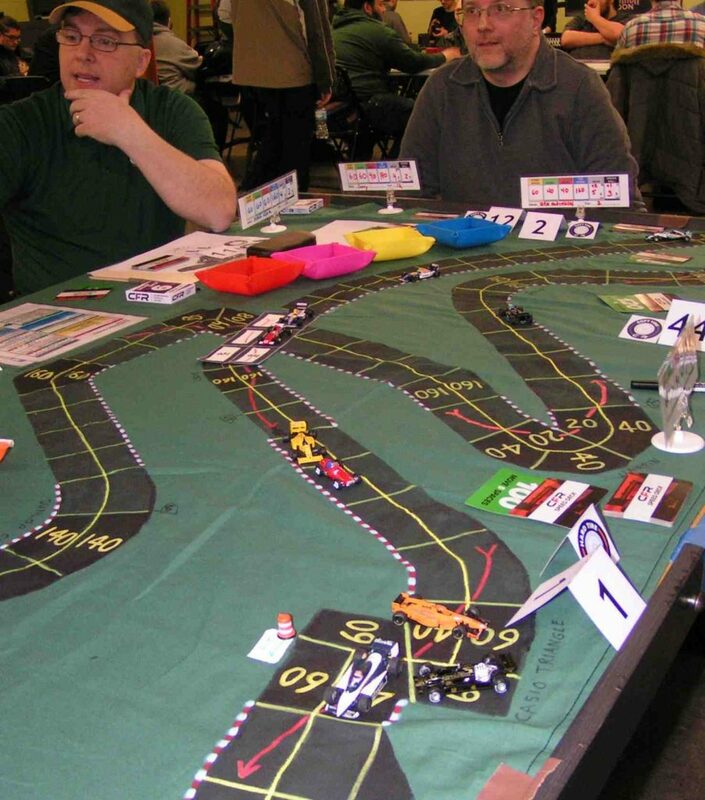 We raced on the older track configuration, using the old Avalon Hill track as our basis for the track. 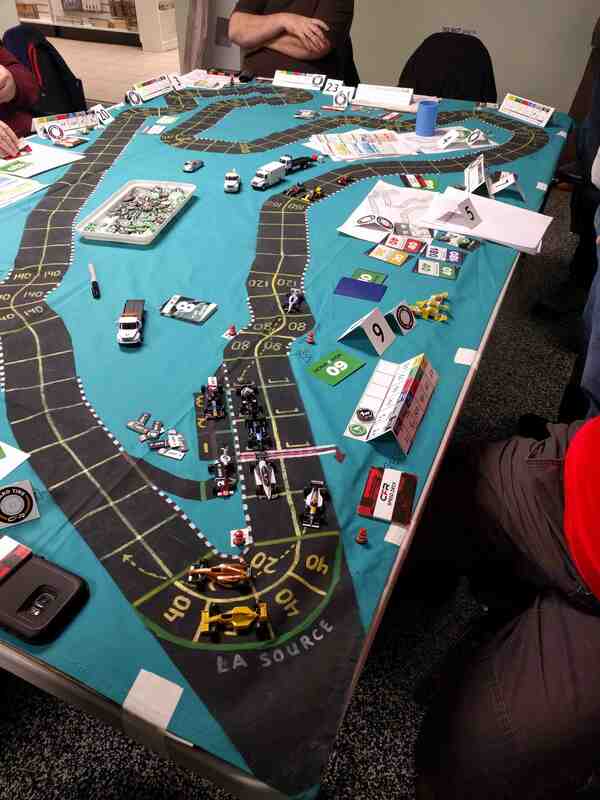 The model track of the Gilles Villeneuve circuit that we raced on. 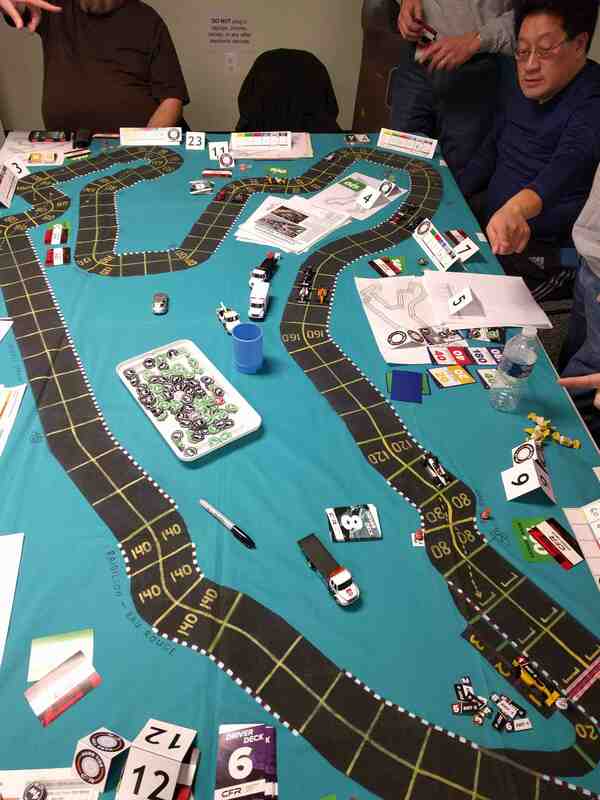 Once again, the bidding for pole position featured rather high bids. (Each wear bid counts as 1.0; each skill bid counts as 0.5.) Mike Cook won his 4th pole position in six races with a bid of 8.0 (2 wear + 12 skill). Starting 2nd was Jack Beckman with a bid of 7.0 (2 wear + 10 skill). 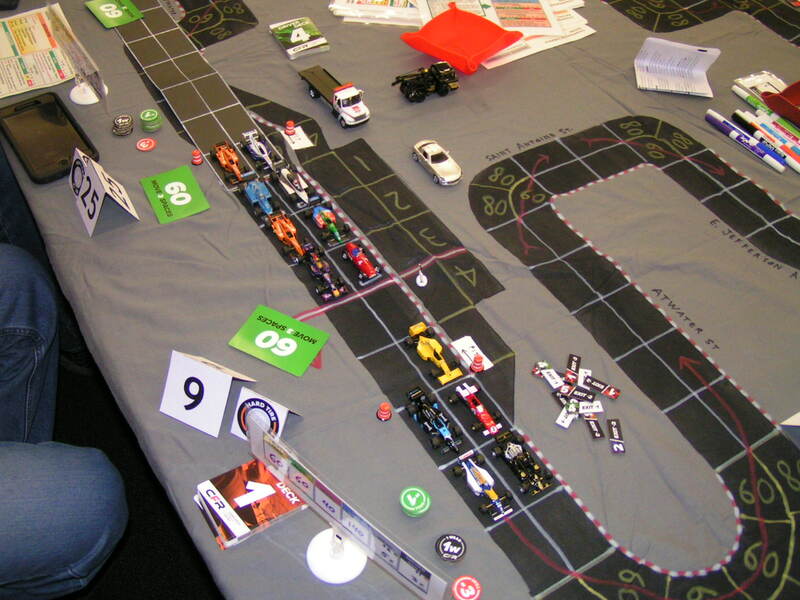 Richard White started 3rd, also with a bid of 7.0 (5 wear + 4 skill), but Jack got 2nd as he rolled better on percentage dice (39 to 03) to grab 2nd from Richard. Gary Sturgeon started 4th with a bid of 6.0 (0 wear + 12 skill). Garry Kaluzny started 6th with a bid of 5.5 (3 wear + 5 skill). Gary Kempen was the 6th starter with his bid of 4.5 (0 wear + 9 skill). Greg Lim was content to start last, in 7th, as he bid nothing. 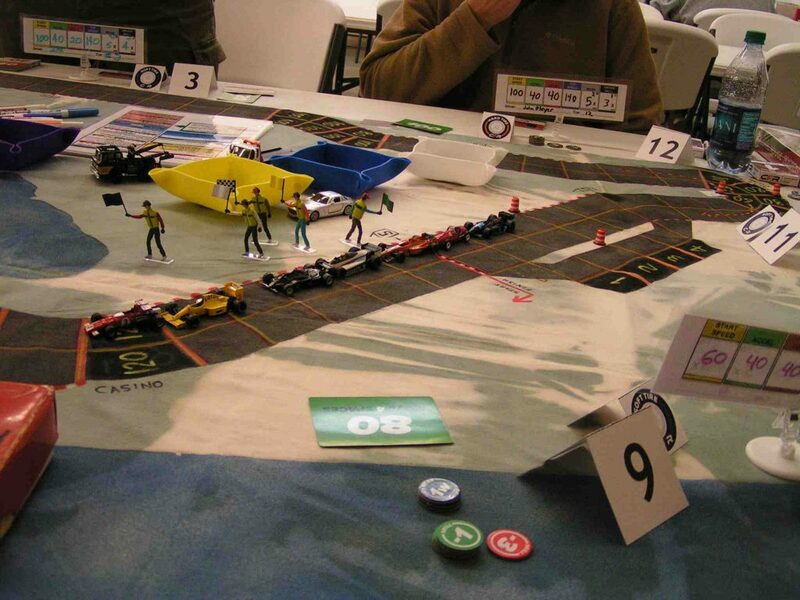 Most of our racers were distressed upon hearing that the “real” Formula One did away with their “Grid Girls”; however, our CFR-Detroit race series decided to hire the now unemployed Grid Girls for our racing series. When the green flag dropped to start the race, Jack Beckman burned a wear (since he was on soft tires) to increase his start speed from 100 to 120 mph, so he roared off ahead of the pole-sitter, Mike Cook, even though Cook had also boosted his start speed. Sturgeon started at his 100 mph start speed, and he was able to pass White for 3rd as White just started at his base 60 mph start speed. Kaluzny, Kempen, and Lim slotted into positions 5, 6, and 7, in the same order as they had lined up on the grid. Everyone was happy that it was a clean start, with nobody getting balked. The cars are away at the start of the Canadian Grand Prix. The running order: Beckman (Ferrari); Cook (Camel Lotus); Sturgeon (John Player Lotus); White (Brabham); Kaluzny (McLaren); Kempen (Ferrari); and Lim (Motorola). The field pretty much stayed in the same order, with the pack finally bunching up at the Epingle de l’Isle. It was there that Kempen made a move to pass Kaluzny and pull to the inside of White, thereby taking 4th place. Kempen (red #4 Ferrari) takes 4th at Epingle de l’Isle. Kempen found that he couldn’t hold onto 4th, however, as coming out of the Epingle de l’Isle he was re-passed by both White and Kaluzny. White was even able to pass Sturgeon for 3rd place. White (Olivetti Brabham) advances to 3rd; Kempen drops back to 6th. The pack mostly stayed bunched together the rest of the 1st lap, although Beckman and Cook did gain a few spaces over the rest of the pack. As the pack roared through the hairpin turn at Epingle du Casino, Beckman, Cook, White, Kaluzny, and Kempen all pitted to exchange their worn-out soft tires for fresh hard tires. Sturgeon stayed on the track with his hard tires, and Lim also stayed on the track, although Lim was riding on soft tires. The first pit stops — Beckman, Cook, White, Kaluzny and Kempen are in the pits; Sturgeon and Lim stay on the track. 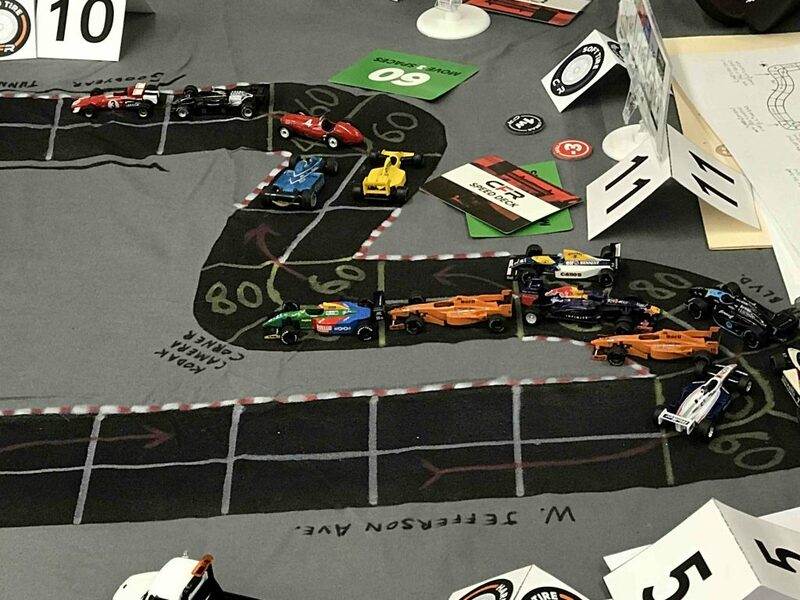 After the 1st round of pit stops, and at the end of Lap 1, the official running order was Sturgeon (+3) and Lim (+6), then 6 spaces to Beckman (-1) and Cook (-3), then 3 spaces to Kaluzny (0), then came White (-3) and Kempen (-1). The numbers in parentheses tell how many spaces a driver either gained (+) or lost (-) from their starting position. Running order at the end of Lap 1: Sturgeon; Lim; Beckman; Cook; Kaluzny; White; and Kempen. 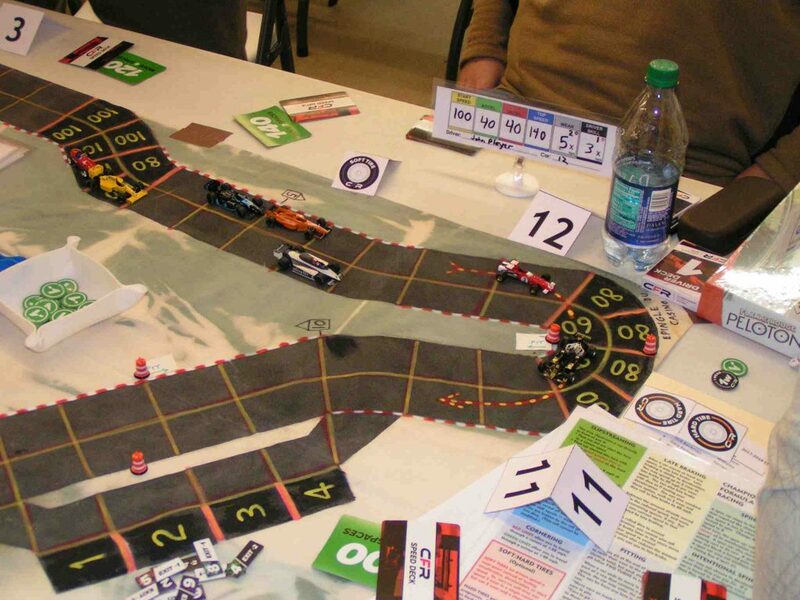 During the next half lap, Kaluzny failed an acceleration dice roll, and Cook failed a deceleration dice roll (Cook failing his roll as he was heading into the slow Epingle de l’Isle). Each driver used only a single -1 skill chit for their roll. In Kaluzny’s case, he rolled an 11, meaning he would have successfully made the roll had he used two -1 skill chits. Extra skill wouldn’t have helped Cook, though, as he rolled a 12. 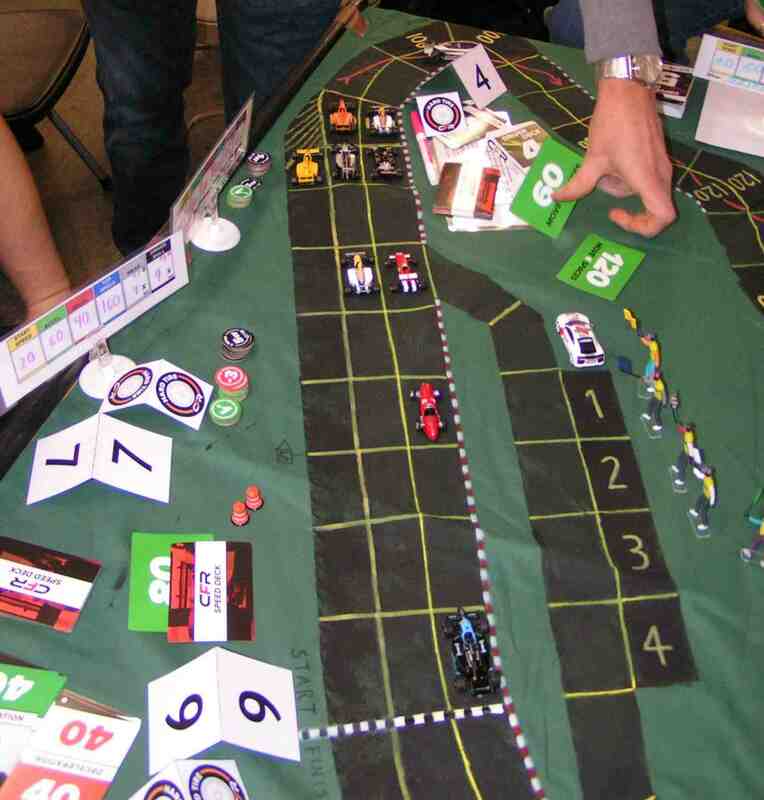 With Kaluzny’s car ailing on acceleration coming out of the Epingle de l’Isle, Kempen successfully made a forced pass of Kaluzny and White, putting Kempen up into 5th place. Kempen takes 5th after a forced pass of White and Kaluzny. Greg Lim (blue sweatshirt, black and blue car in 2nd place on the track) looks over his cards to plot his car’s speed for the upcoming game turn. Near the end of the 2nd lap, Sturgeon had built a lead of 6 spaces over Lim, and then Sturgeon pulled into pit lane to change from his worn-out hard tires onto soft tires for the final lap. Sturgeon pits at the end of the 2nd lap. 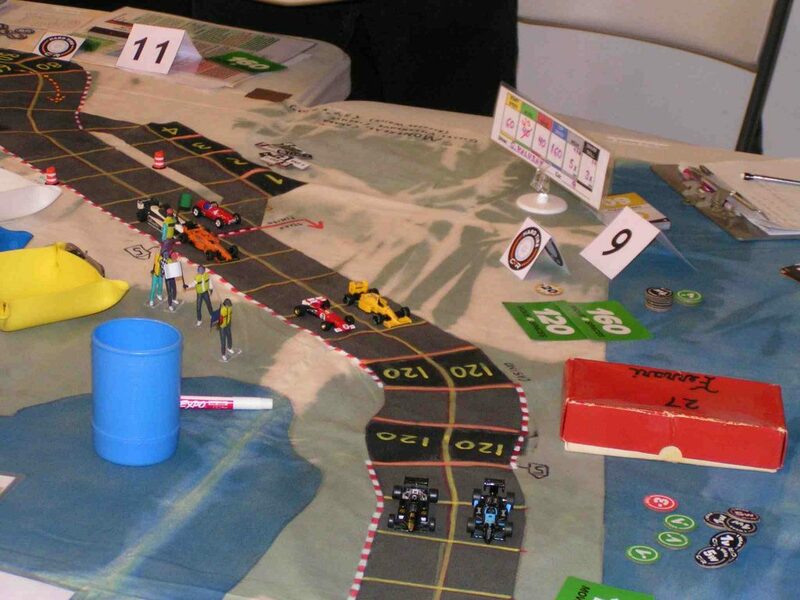 Then Lim pulled into the pits a turn later, and as expected, everyone else stayed on the track. When Sturgeon got back on the track after his pit stop, he had fallen to 4th place, 5 spaces behind the new leader, Beckman. However, Sturgeon now had a full complement of 15 wear, while Beckman had used up most of his wear on the 2nd lap. Taking the white flag, Beckman leads after two laps. Former leader Sturgeon is back on the track in 4th place, next to White’s Brabham. At the end of the 2nd lap, the two Ferraris of Beckman (+1) and Kempen (+4) were in the lead. Then came Sturgeon (+1), White (-1), Cook (-4), Kaluzny (-1), and Lim (0). The Ferraris of Beckman and Kempen lead the start of the final lap. 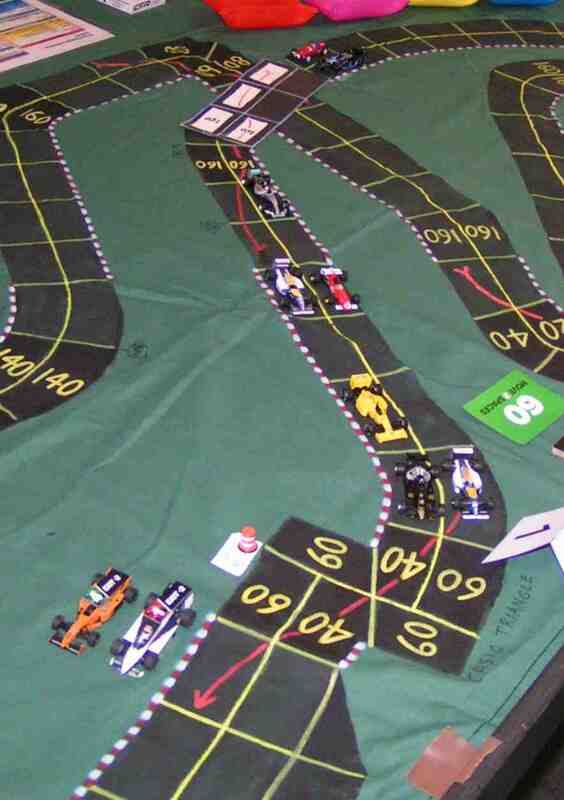 Sturgeon finally made his move for the lead the final time through the Epingle de l’Isle corner. 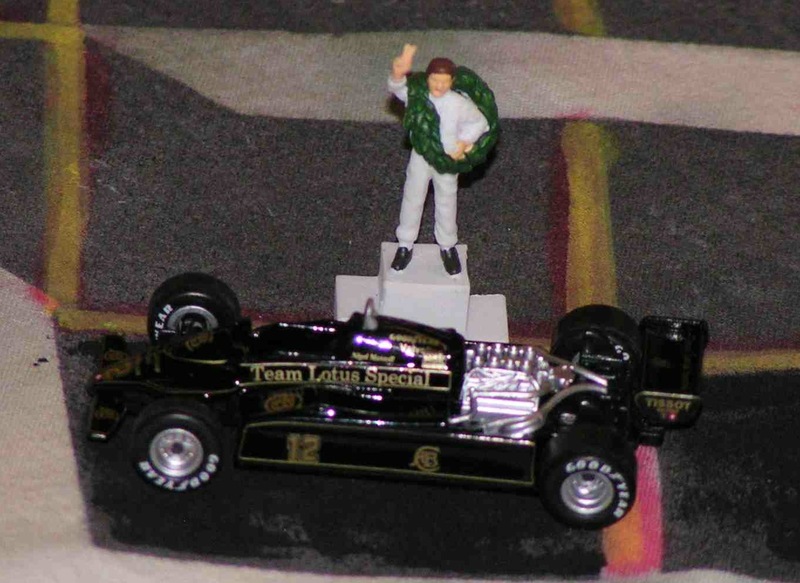 He pulled alongside Beckman’s #3 Ferrari, then Sturgeon’s John Player Lotus pulled in front as they exited that corner. Sturgeon (black #12) pulls alongside Beckman (red #3) at the Epingle de l’Isle. Sturgeon accelerates into the lead. Trailing are Beckman, Kempen, White, Kaluzny, Cook, and Lim. Kempen spun just before the “S” curves, dropping him from 3rd to 6th place. It was good for him that he used his -3 skill chit, because he rolled a 12 on the Chance Table. If he had only used two -1 skill markers, that would have been a crash. In the meantime, Beckman was trying to hang with Sturgeon. Surprisingly, Kaluzny and Cook were staying near the leaders, even though Kaluzny’s car only had a 20 mph acceleration and Cook’s car only had a 20 mph deceleration. Through the “S” curves the final time; Sturgeon still leads from Beckman while Kempen has recovered from his spin but is now in 6th place. 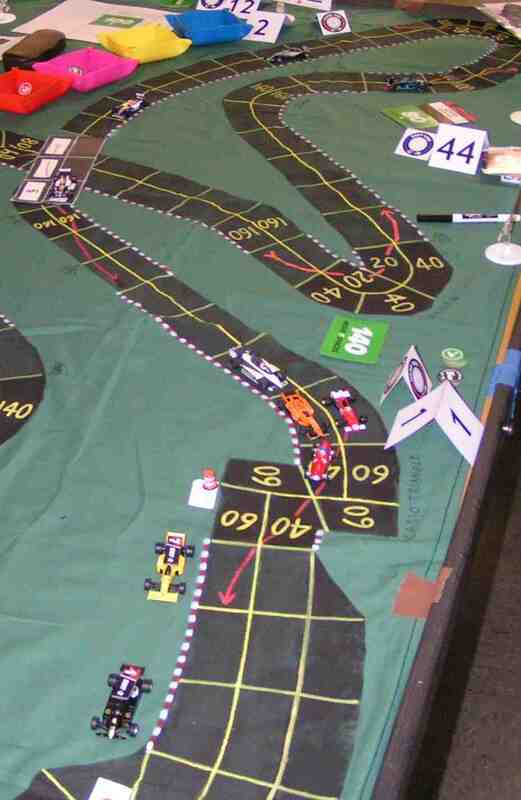 Down through the chicane for the final time, Sturgeon maintained his grip on 1st place. He then was able to enter the final Epingle du Casino corner before Beckman, thereby assuring Sturgeon of the victory. Through the chicane that last time, Kempen managed to successfully pass an unmodified Chance roll by rolling a 4. He needed to roll a 6 or less to make it through with spinning or crashing. Sturgeon leads Beckman at the final corner. 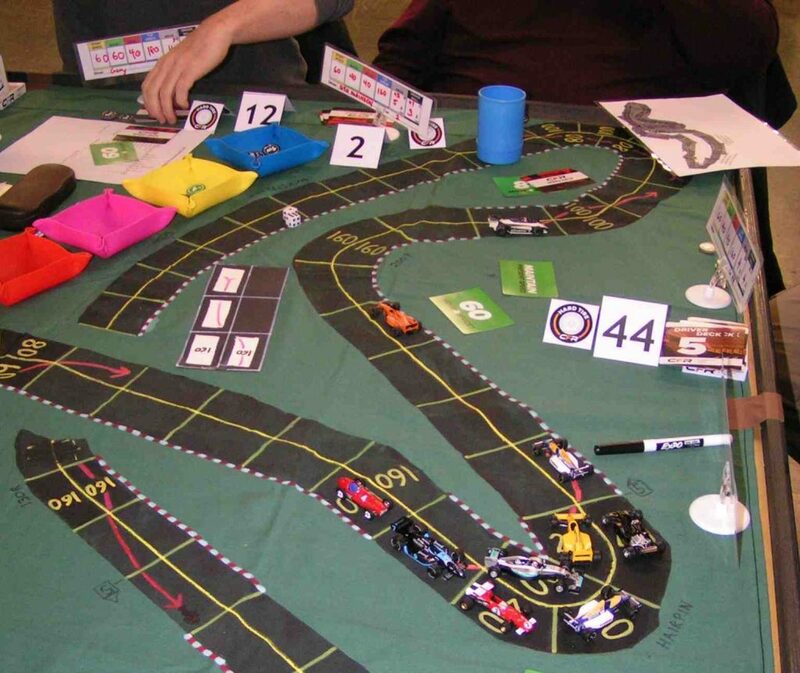 Although Sturgeon was about to take the checkered flag for his second straight win, there was still much excitement to occur in that final corner. Lim tried to maintain a high rate of speed around the outside of the corner in an attempt to pass Kaluzny, but Lim spun. 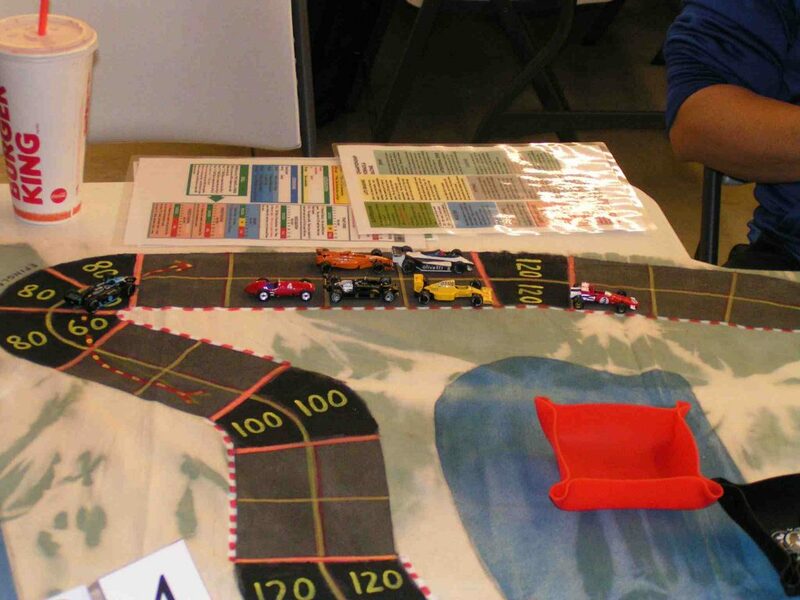 Sturgeon about to take the checkered flag, while Lim spins on the outside of the final corner. 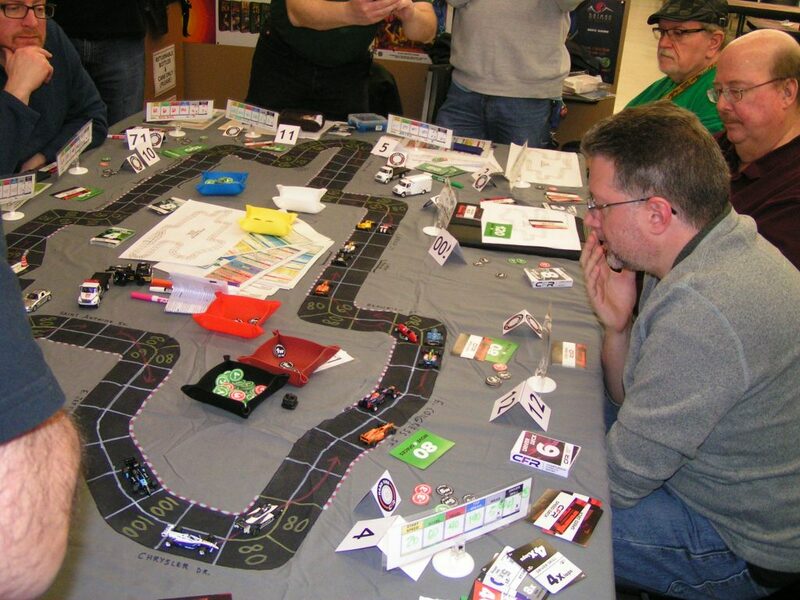 Mike Cook looks on with concern, trying to figure how he can make it through the final corner with damaged brakes. As Lim recovered from his spin, he moved out of the corner but he hogged the cornering line, just to make it tough on the two following cars to make it through that corner. Indeed, Cook had to roll on the Deceleration Table once again, using his last -1 skill token. 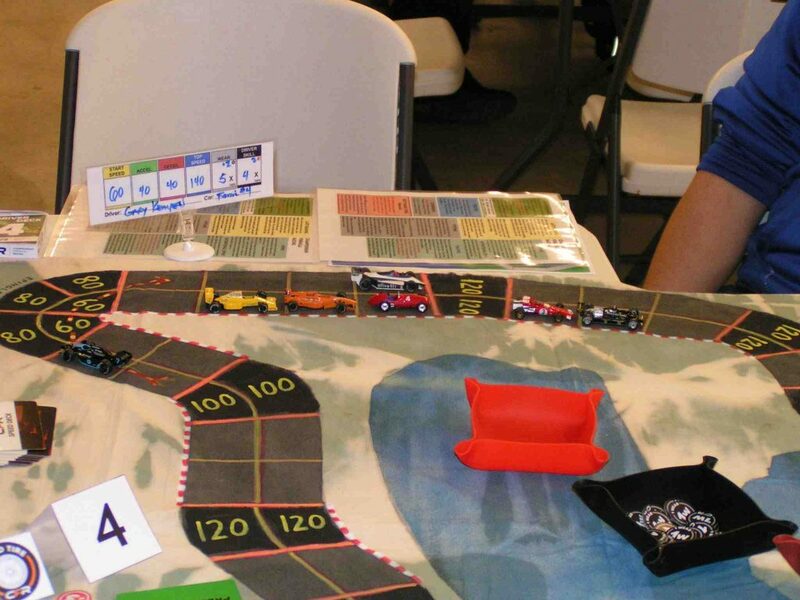 Unfortunately for him, he rolled an 11, which was the second time he had failed a deceleration dice roll, thereby putting his car out of the race with failed brakes. 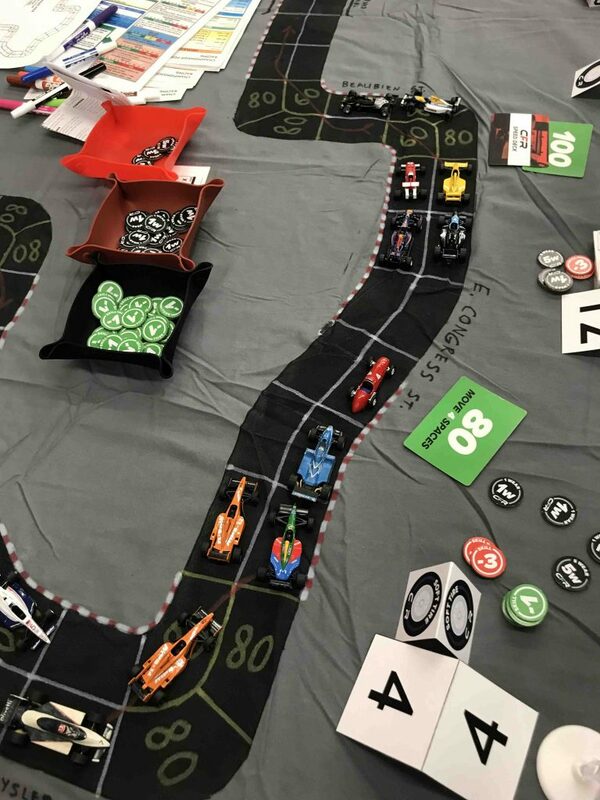 Then Kempen’s Ferrari tested the fates one more time, but this time failed the Chance dice roll by crashing out of the race. Cook was classified 6th, and Kempen 7th, but Cook failed to score the single point for 6th because cars must finish a race in order to gain any points. Sturgeon wins from Beckman, meanwhile, Cook (yellow car) lost his brakes, and Kempen (upside-down Ferrari) crashed in the final corner. 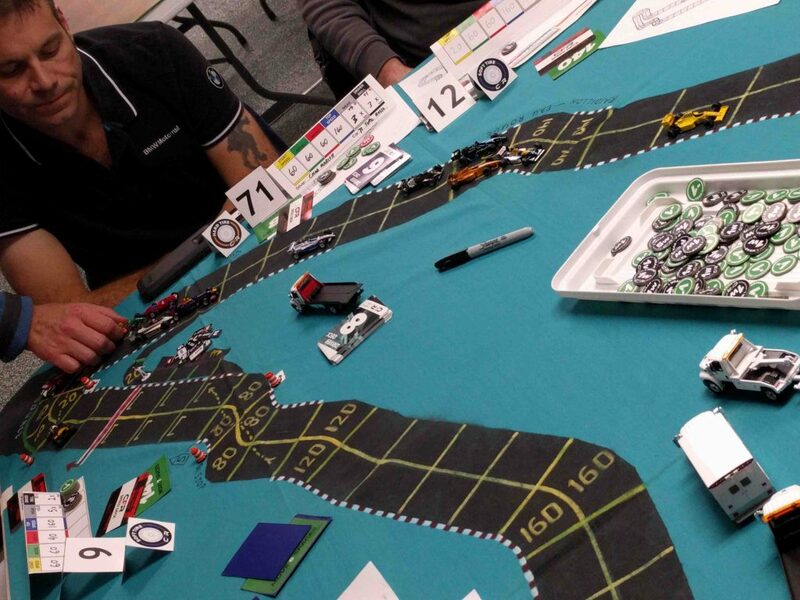 At the checkered flag, it was Sturgeon (+3), then Beckman (0), White (0), Kaluzny (+1), and Lim (+2). Out of the points with DNFs were Cook (-5) and Kempen (-1). Driver Gary Sturgeon (well, at least a 1:32 scale representation of Sturgeon) stands atop the Victory Podium. 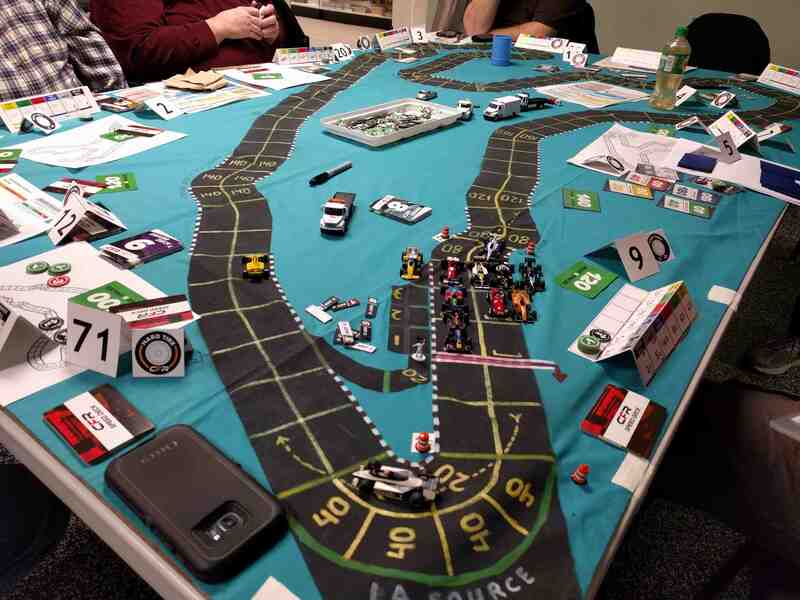 The points awarded at the Canadian Grand Prix: Sturgeon 10; Beckman 6; White 4; Kaluzny 3; and Lim 2. 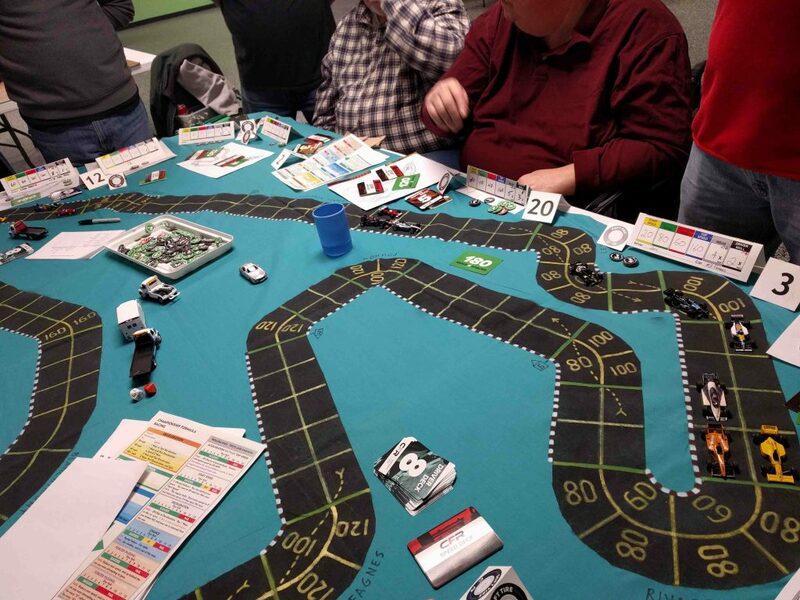 The 7th race of the CFR-Detroit racing season is on Friday, March 9, 2018, at Imperium Games at 28990 S. Wixom Road in Wixom, Michigan. 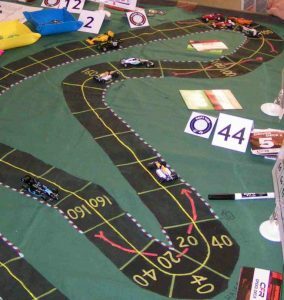 Race time is 7:00 pm, although we ask racers to be there by 6:30 pm in order to set up their car. We also want to have bidding for starting positions start at 6:55 pm. 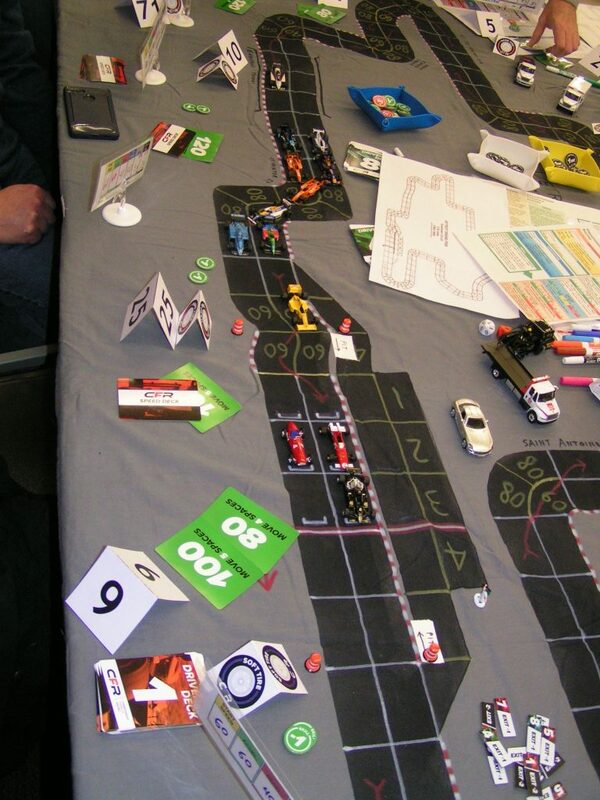 January 12, 2018, saw 13 racers compete at the Detroit Grand Prix, racing on the old downtown Detroit track. 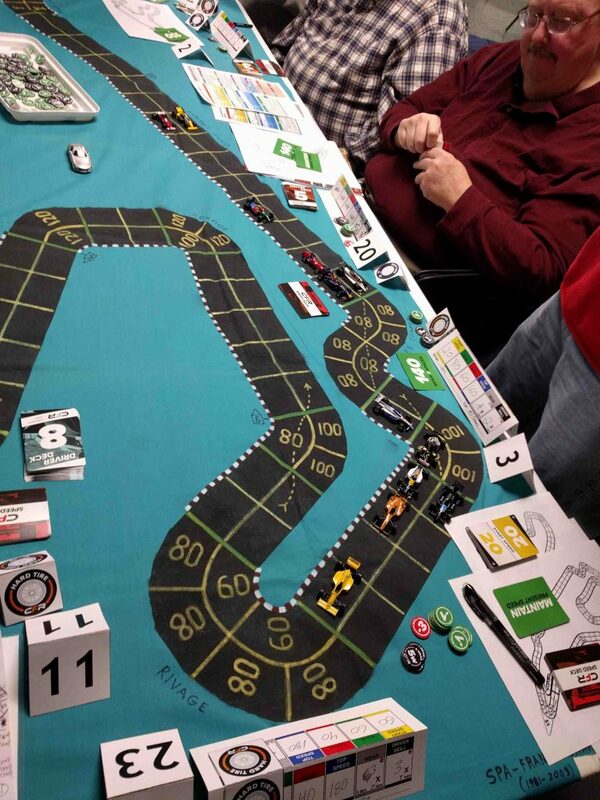 The race was held at RIW Hobbies & Games in Livonia, Michigan. When the engines stopped revving, Gary Sturgeon had earned his first victory of the season, propelling him into 2nd place in the points standings. Other podium finishers were Jack Beckman (2nd) and Gary Kempen (3rd), aka Team Ferrari. 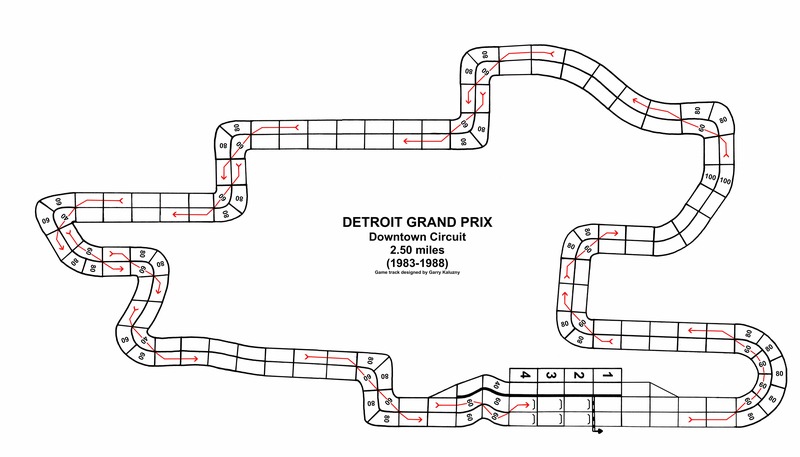 Downtown Detroit track used from 1983 through 1988. 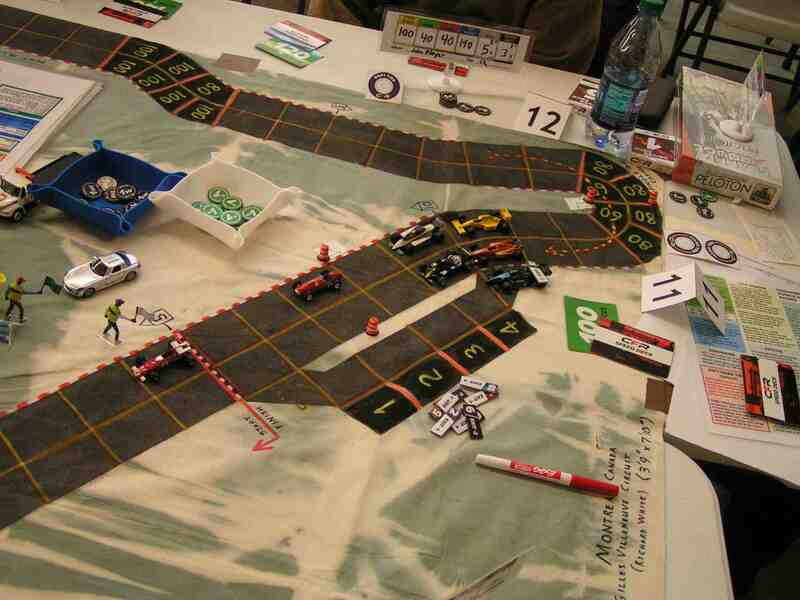 Downtown Detroit track suitable for use with Championship Formula Racing. Pole Position went to Jim Robinson, his first Pole of the season. Jim bid 2 Wear and 12 Skill (all of his -1 Skill markers!) for a bid of 8.0. 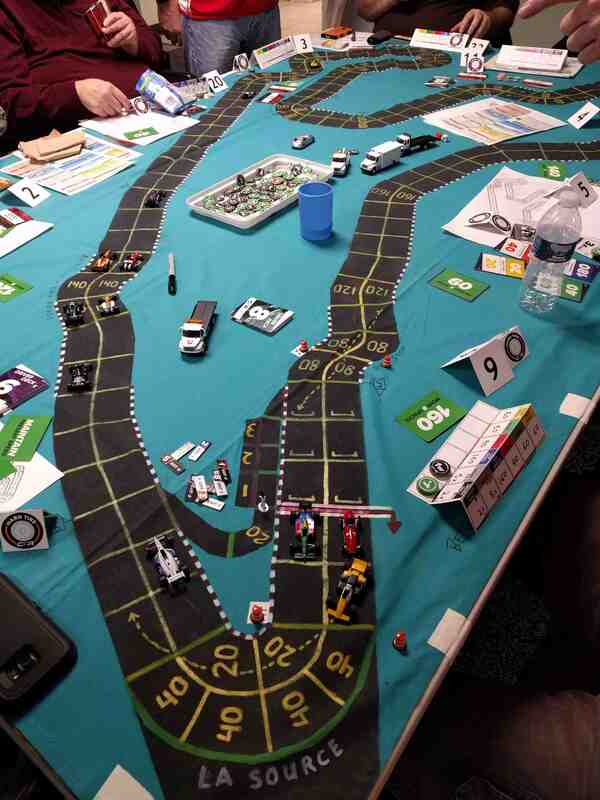 Four drivers, Gary Sturgeon (0 Wear, 12 Skill), Jack Beckman (1 Wear, 10 Skill), Greg Lim (0 Wear, 12 Skill), and Mike Cook (2 Wear, 8 Skill), all bid 6.0. 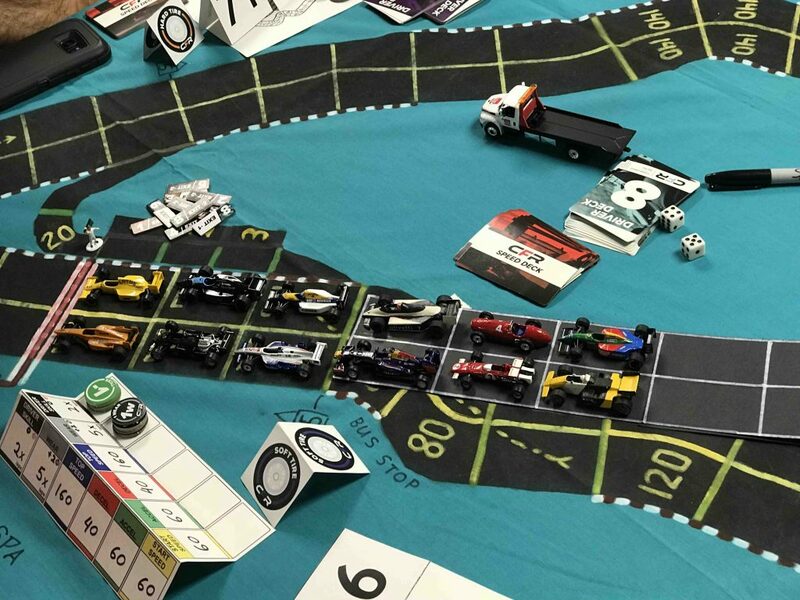 They then all rolled percentage dice, rolling 91, 73, 64, and 07, respectively, so Sturgeon was 2nd on the grid, Beckman was 3rd, Lim 4th, and Cook was 5th. 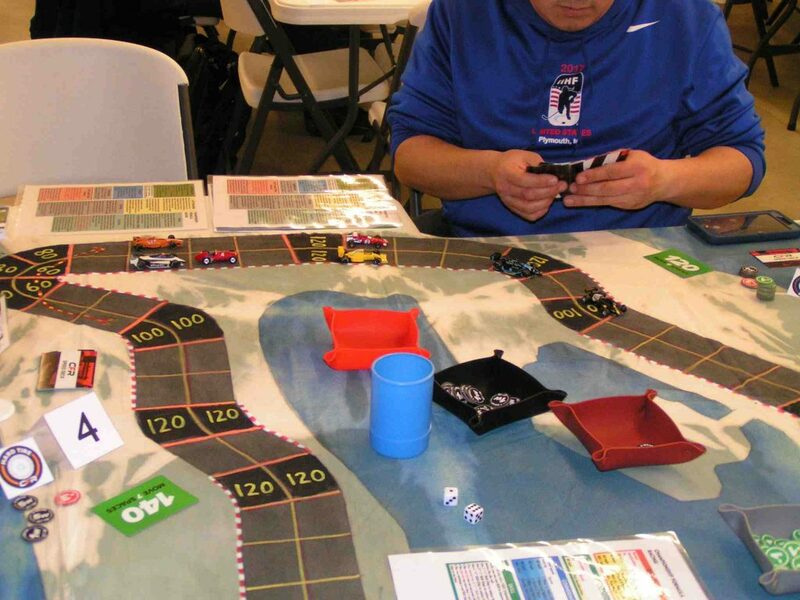 Two drivers, Gary Kempen (2 Wear, 5 Skill) and Chad Marlett (3 Wear, 3 Skill) bid 4.5, with Kempen winning the percentage dice roll-off by 44 to 39, thus giving Kempen the 6th starting spot on the grid and relegating Marlett to 7th. Jim Landis slotted into the 8th starting spot with a bid of 4.0 (1 Wear and 6 Skill), and Garry Kaluzny grabbed 9th after bidding 3.5 (2 Wear and 3 Skill). 10th place went to Richard White with his bid of 3.0 (3 Wear and 0 Skill). 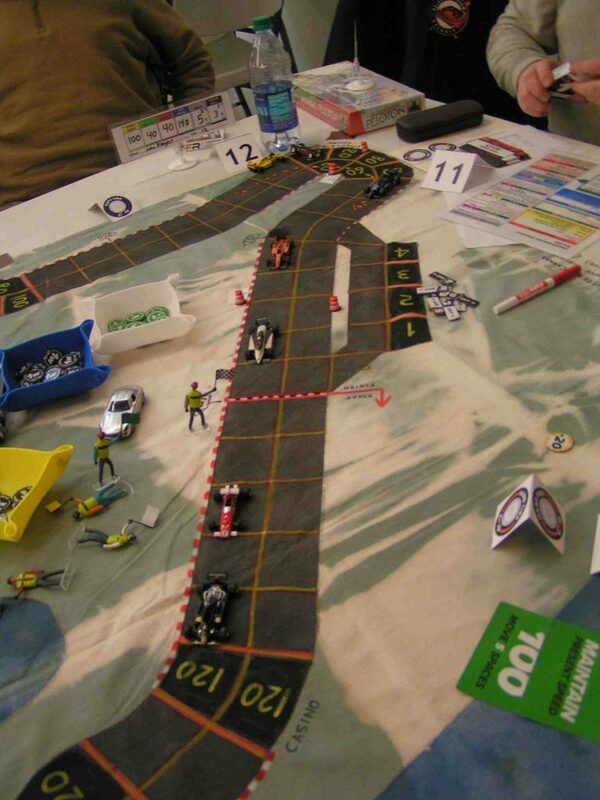 11th place was contested by identical bids of 2.5 by Mike Manderachia (2 Wear, 1 Skill) and Brian Robinson (0 Wear, 5 Skill), with Manderachia winning the roll-off by 93 to 90, thus placing Brian Robinson in 12th place. Newcomer Tim Gould started 13th with a bid of only 1.5 (1 Wear and 1 Skill). It was nice to have Mike Manderachia race with us. Although this was his first race using the Championship Formula Racing rules, Mike used to race with us using the Advanced Speed Circuit rules back in the late 1980s. We also had newcomer Tim Gould in his first race, and Gary Kempen and Chad Marlett were in only their 2nd races. It was interesting that two cars (Beckman and Cook) opted for a 100 mph Start Speed, while two others (Kempen and B. Robinson) chose 20 mph as their Start Speed. All drivers went with a 140 mph Top Speed (taking a point out of that characteristic so they could use it elsewhere) since Detroit only has one place where a car could conceivably go 160 mph (and probably wouldn’t get the chance if it was in traffic), and all drivers but one (Marlett) went with the maximum Wear of 5x, meaning they would start with 5 x 3 Wear = 15 Wear to start the race (minus any Wear they used in bidding for starting position). 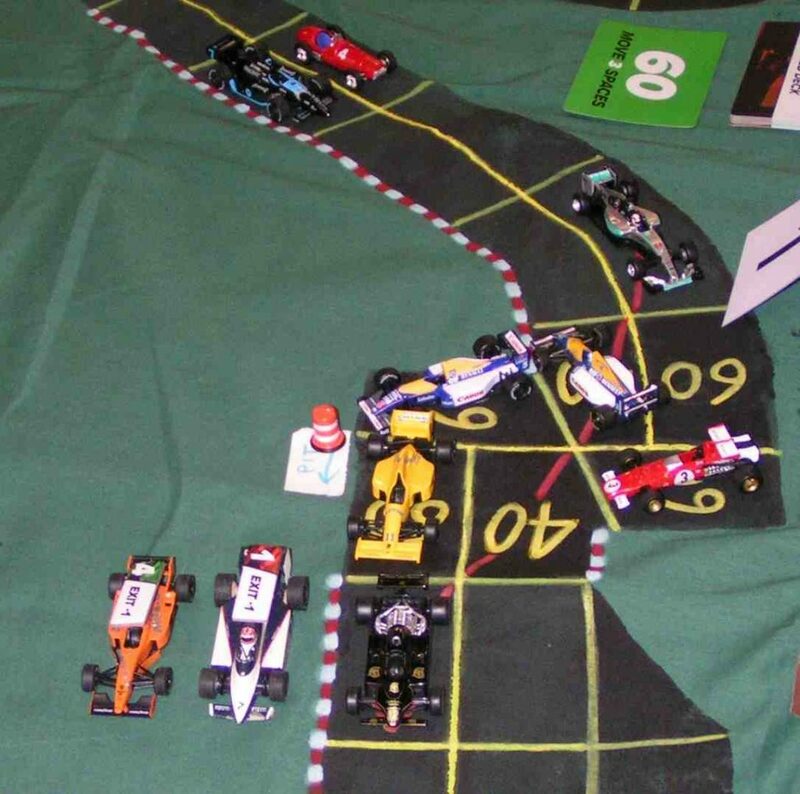 The starting grid for the Detroit Grand Prix: Jim Robinson (white/yellow/blue Williams) is to the inside of the track, Gary Sturgeon (black John Player Lotus) is to the outside. When the green flag dropped to start the race, the front row cars of J. Robinson and Sturgeon both boosted their Start Speed to 80 mph, both using wear since they were both on soft tires. 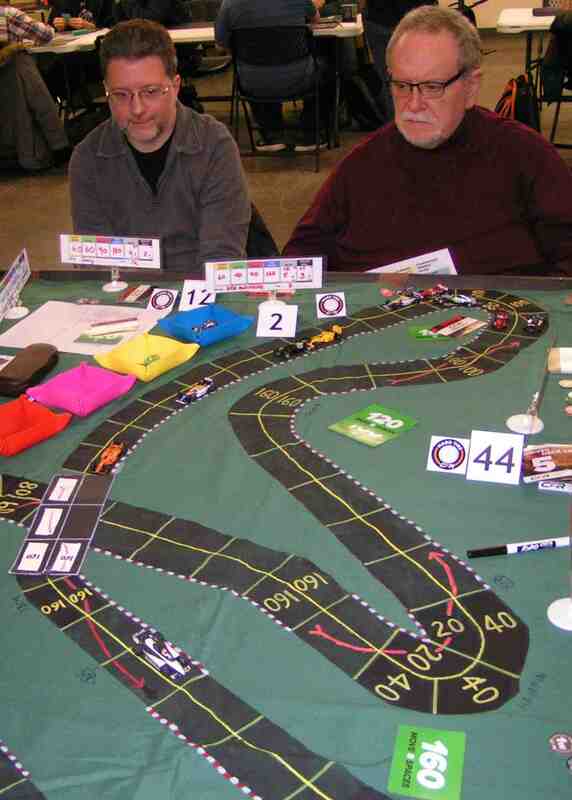 As Jim Robinson was to the inside of the track on the starting grid, he moved first, opting to take the cornering arrow for the first turn, thus allowing Sturgeon to take the inside position (and the lead). Beckman’s 100 mph start availed him nought, as he had to brake down to 80 mph to stay behind the two leaders. (Note: If Beckman had pushed his start speed to 120 mph, he could have attempted a forced pass and could possibly have taken the lead.) Greg Lim also boosted his Start Speed of 60 mph t0 80 mph by using a wear. Mike Cook also had to slow to 80 mph from his Start Speed of 100. The top five cars had now opened a two-space gap over the rest of the field. In the back pack, both Landis and White were balked and had to forced decelerate from 60 to 40 mph. Roaring off at the start of the Detroit G.P. Sturgeon (black car) has taken the lead from J. Robinson. Then Beckman, Lim, and Cook are close behind the leaders. The 2nd pack is Kempen, Marlett, Landis, Kaluzny, White, Manderachia, B. Robinson, and Gould. On the 2nd move, Sturgeon plotted 120 mph and went around the outside of the 1st turn. J. Robinson plotted 100 mph and stayed to the inside (thus retaking the lead). Both cars were ready to exit that corner. Lim was right behind J. Robinson’s tailpipe, while Beckman was right behind Sturgeon. Cook had moved just 80 mph (4 spaces on the track) and had just entered the corner. Then came the rest of the field, with B. Robinson lagging back a bit, just to see how things would sort out at this first corner. 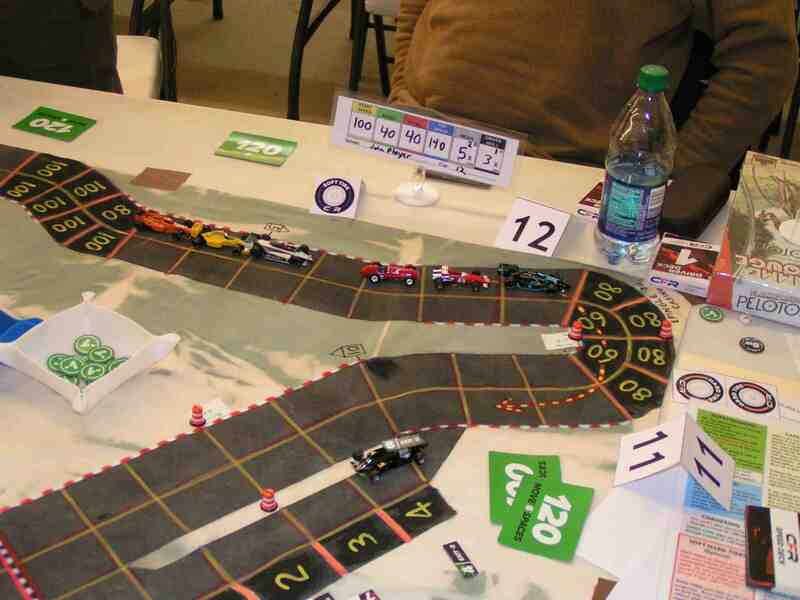 Through the 1st corner, the running order is: J. Robinson; Sturgeon; Beckman; Lim; Cook; Kempen; Marlett; Manderachia (up 3 positions); Kaluzny; Landis (down 2 positions); White; Gould, and B. Robinson. The pack roared down Atwater Street, then turned right onto Saint Antoine, turned right again onto E. Jefferson Ave., then followed the lazy left-hand curve onto Chrysler Drive, which is the service drive for the I-375 expressway. Then a sharp left-hand turn onto E. Congress Street came next. At the sharp left hand turn onto Beaubien, Sturgeon (+1) narrowly led Jim Robinson (-1). Then came Beckman (0), Cook (+1), Marlett (+2), Lim (-2), Kempen (-1), Manderachia (+3), Landis (-1), Kaluzny (-1), Gould (+2), White (-2), and Brian Robinson (-1). The +/- indicates how many positions a driver has gained (+) or lost (-) from their qualifying position. After the left turn onto Beaubien came a right turn onto Larned St. Coming out of that corner, Jim Robinson regained the lead from Sturgeon. Then after a short straight, there was a left onto Woodward Avenue followed by a right onto W. Jefferson Ave. Just at the turn onto W. Jefferson, Beckman and Cook had got right up with J. Robinson and Sturgeon. Manderachia was up to 5th place, having gained 6 positions since the start of the race. Turning onto W. Jefferson. The pack has bunched up. The pack raced down the short straight on West Jefferson, passing the Pontchartrain Hotel on their right just before making a sharp left turn onto Washington Boulevard right in front of Cobo Hall (before it was renamed Cobo Center). They raced down the steep incline around Cobo Arena, then turned right at the more than 90-degree Kodak Camera Corner, followed quickly by a hard left turn onto Atwater. Into the Goodyear Tunnel under Hart Plaza for the first time, it was Sturgeon with a two-space lead over Jim Robinson. Then came Cook in 3rd, Beckman in 4th, then Manderachia, Marlett, Kempen, Landis, Kaluzny, Lim, Gould, White, and Brian Robinson. Through the Goodyear Tunnel, Sturgeon leads the pack. Coming out of the Goodyear Tunnel, Sturgeon led the pack through the right-left Ford Corner, then Sturgeon was the first to pull into the pits. He was quickly followed by J. Robinson, Kempen, Manderachia, Landis, Marlett, and Gould. All of those cars switched from soft to hard tires. The 1st pit stops are under way. Although Sturgeon pulled into the pits first, technically Jim Robinson leads the first lap as his car’s nose is on the start/finish line. A couple of turns after the leaders, the cars of Lim, White, and B. Robinson also pitted to switch from soft to hard tires. Cars not pitting were those of Beckman, Cook, and Kaluzny. The official order after one lap was: Jim Robinson (0); Beckman (+1); Cook (+2); Kaluzny (+5); Sturgeon (-3); Brian Robinson (+6); Lim (-3); Kempen (-2); Manderachia (+2); Landis (-2); Marlett (-4); Gould (+1); and White (-3). However, the running order after the pit stops at the end of the 1st lap were all completed was: Beckman, Cook, Sturgeon, J. Robinson, Kaluzny, Kempen, Manderachia, Landis, Marlett, Gould, B. Robinson, White, and Lim. Running order after 1st pit stops: Beckman in the red Ferrari leads from Cook in the yellow Lotus. During the 2nd lap, the pack got stretched out after the pit stops. 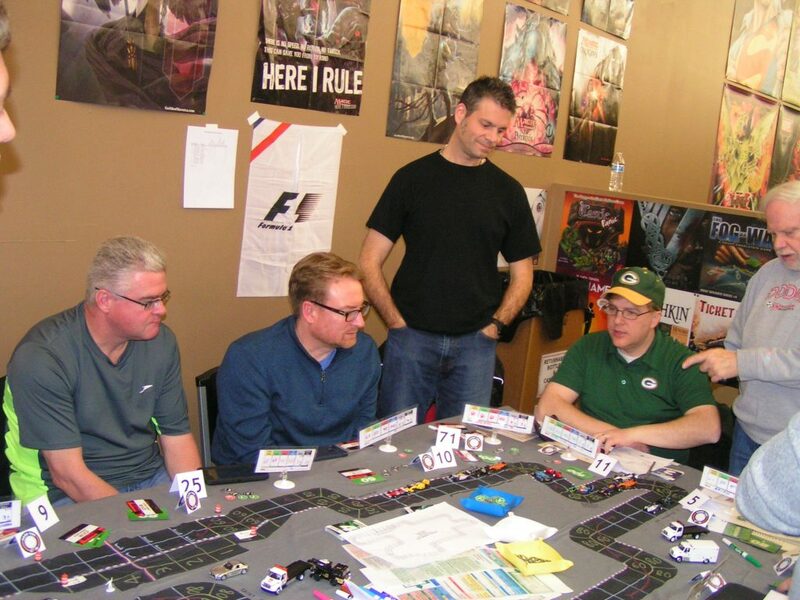 Beckman continued to lead for about a half lap, and then Cook took the lead on Larned St.
Cook passes Beckman on Larned St. Faces pictured: Tim Gould (at left); Jim Robinson (green shirt); Jim Landis (burgundy shirt); and Gary Sturgeon (gray shirt). Cook (in the Green Bay cap and shirt) enjoys his lead over Beckman and the rest of the pack. Brian Robinson (Dodge sweatshirt) stands next to Cook. But Beckman fought back going through the Kodak Camera Corner and through the left-hand corner leading into the Goodyear Tunnel, and retook the lead. 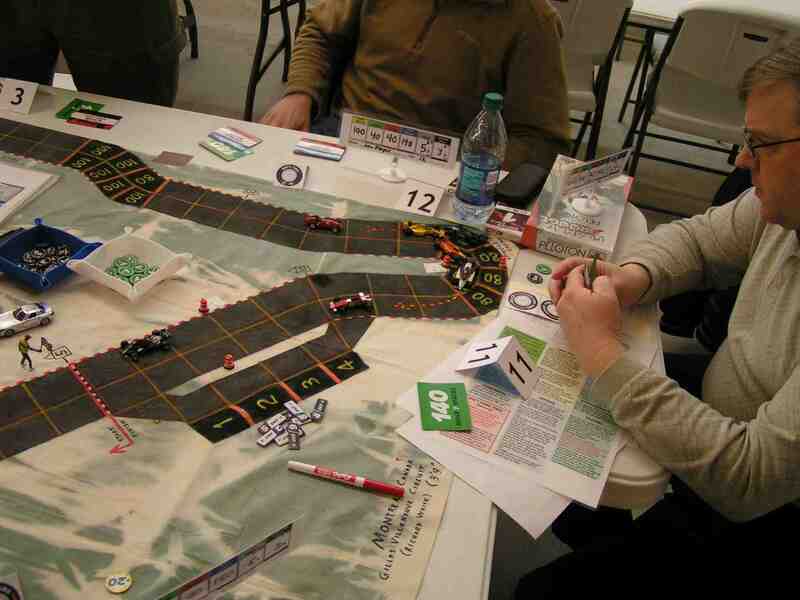 Gamers take their racing seriously! Pictured, from left: Mike Manderachia; Tim Gould; Chad Marlett (standing); Mike Cook; Brian Robinson. Beckman led through the Ford Corner and then into the pits where he was joined by Cook and Jim Robinson. J. Robinson was pitting for the 2nd time in the race. Garry Kaluzny was feeling frustrated that he couldn’t make it into the pits on the same turn, and his ending up two spaces short of being able to pit on the same turn with the leaders cost him, as when he did finally come out of the pits, the rest of the pack swallowed him up. Those four drivers all switched from hard to soft tires for the final lap. The 2nd round of pit stops begin. Beckman, Cook, and Jim Robinson have pulled off the track and into the pits. Kaluzny’s orange McLaren is two spaces short of being able to pit. 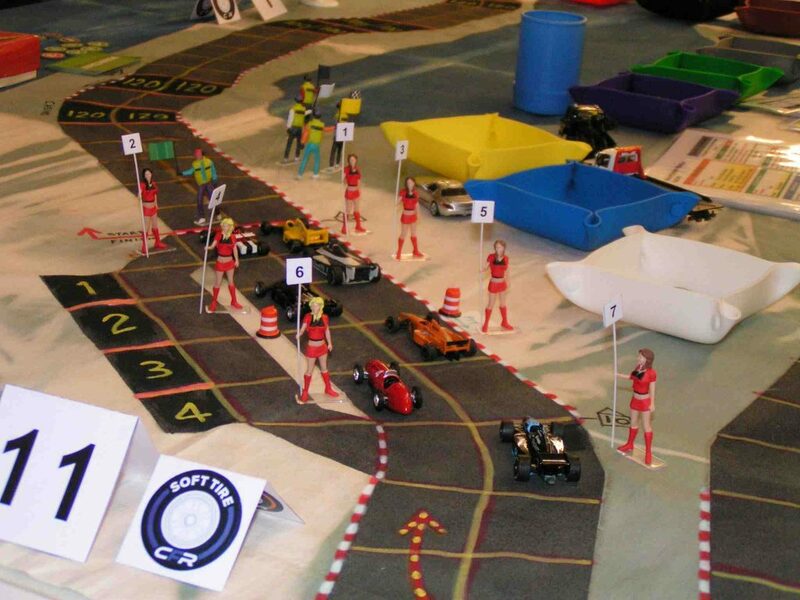 The first space where cars can pull into the pits is the 60 mph space just this side of the orange barrel; the final space is at the lower edge of the picture, two spaces past the finish line. 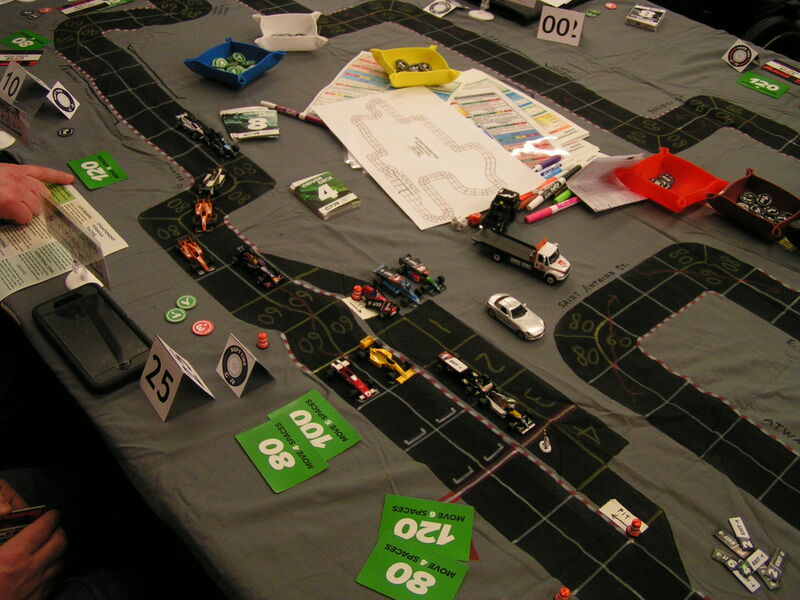 Kaluzny did get some satisfaction after his next move, though, as when he did pull into the pits he was officially the leader of the 2nd lap, although that lead was very short-lived. Kaluzny takes the lead after pulling into the pits, as his car has reached the finish line. Too bad for him there is another lap to go! When the cars in the pits finally got back on the track, Gary Sturgeon had built a 5-space lead over his closest pursuers, Marlett and Kempen. Gary Sturgeon takes the lead at the start of the final lap! 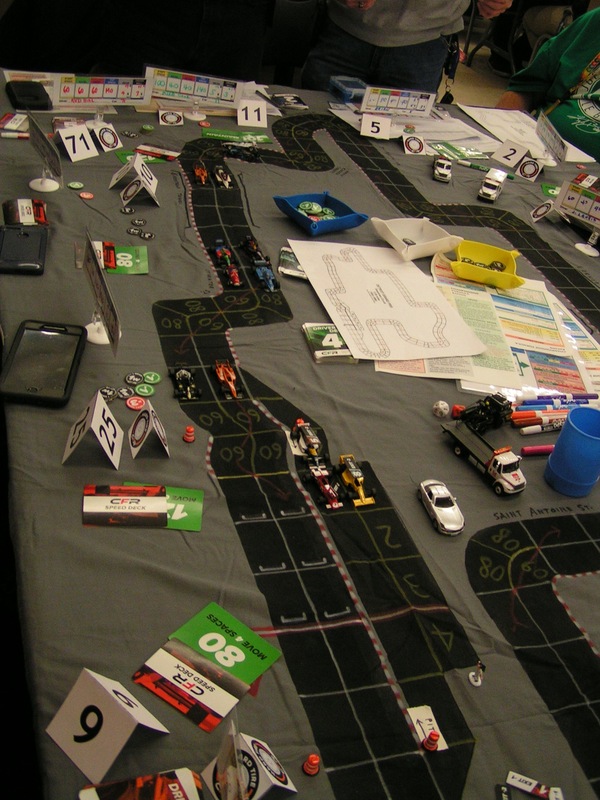 The official order at the end of the 2nd lap was: Kaluzny (+8); Sturgeon (0); Marlett (+4); Kempen (+2); Beckman (-2); Manderachia (+5); Cook (-2); Landis (0); J. Robinson (-8); White (0); Gould (+2); B. Robinson (0); and Lim (-9). However, after the pit stops were well and truly sorted out, the running order on the track was: Sturgeon; Marlett; Kempen; Beckman; Manderachia; Cook; Landis; J. Robinson; White; Kaluzny; Gould; B. Robinson; and Lim. Sturgeon’s lead has shrunk to one space over Beckman at the end of Congress St.
Beckman then made a supreme effort to pass Sturgeon, and succeeded by out-braking Sturgeon at the end of Larned Street. Beckman then did everything he could to hold his lead, while points leader Cook leap-frogged a couple of competitors and got into 5th place. Kaluzny successfully made a forced pass of Marlett on the ramp leading down to the Kodak Camera Corner from Washington Blvd. Marlett attempted to block, but Kaluzny rolled low enough on the Forced Pass table to not only get by Marlett but Kaluzny also passed Jim Robinson with that same move. 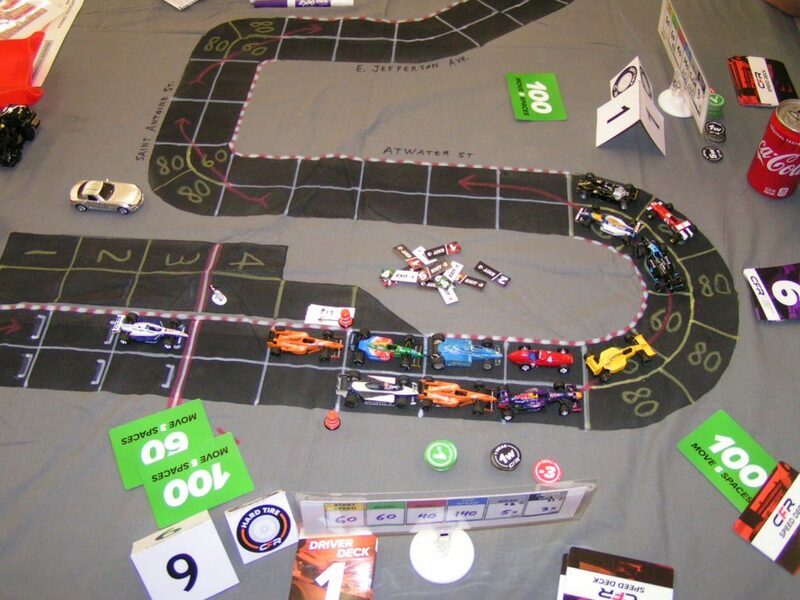 However, one of the dice showed a “3” which meant that the defending car (Marlett) had to lose a wear. 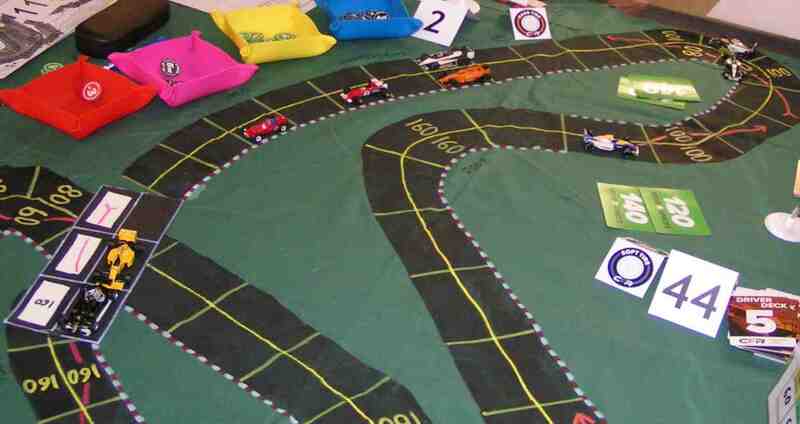 But Marlett’s car was out of wear, and that meant his car spun out. 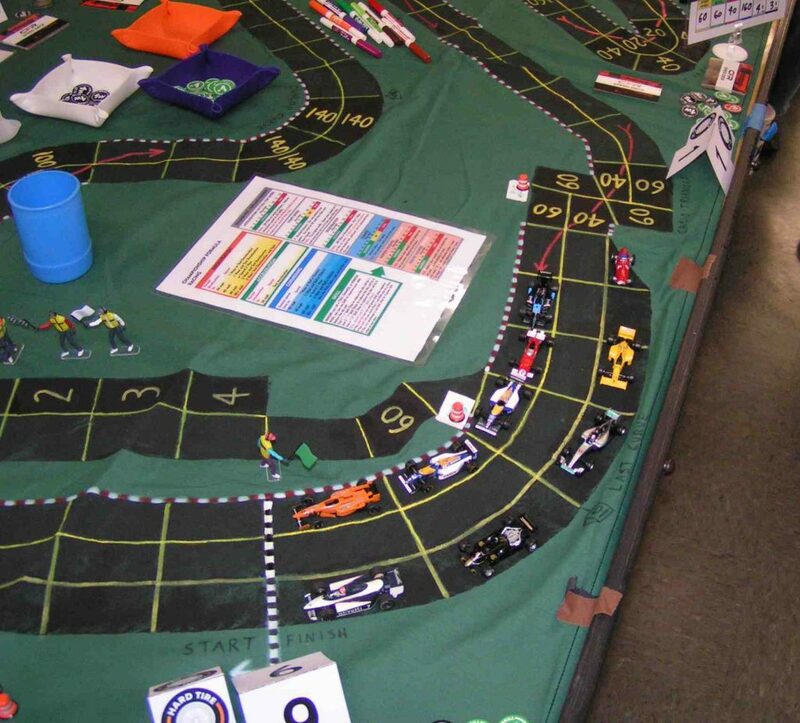 (See the above picture to see Marlett’s Red Bull car facing the wrong way on the track.) Marlett had also spun on the previous corner, and the two spins dropped him from 5th to 8th, and then he fell further to 9th place by the time he got back up to speed. The drama continued of what would be a nail-biting finish to the race! Through the Goodyear Tunnel, the 2nd Ferrari of Gary Kempen got by Gary Sturgeon’s Lotus, taking over 2nd place from Sturgeon. The two Ferraris held their side-by-side lead over the Lotus through the Ford Corner. 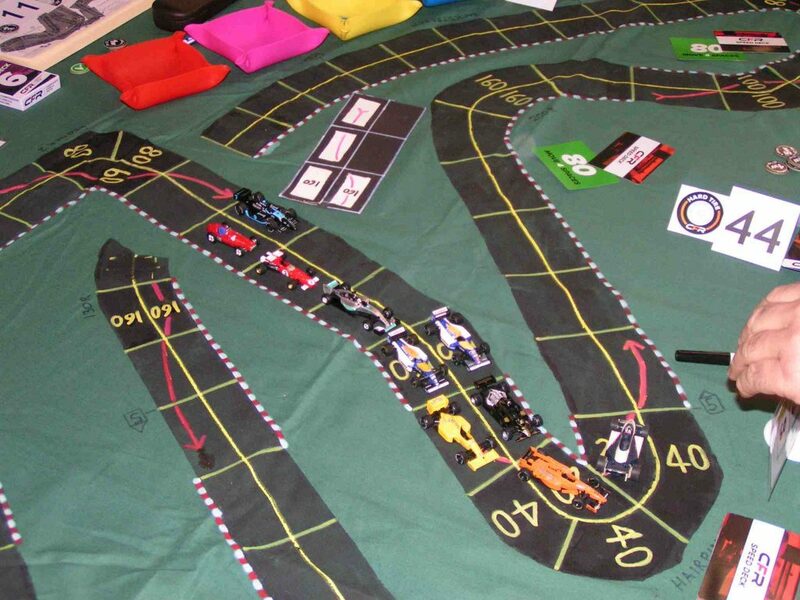 The Ferraris lead over Sturgeon’s Lotus with only one more chicane between them and the end of the race. 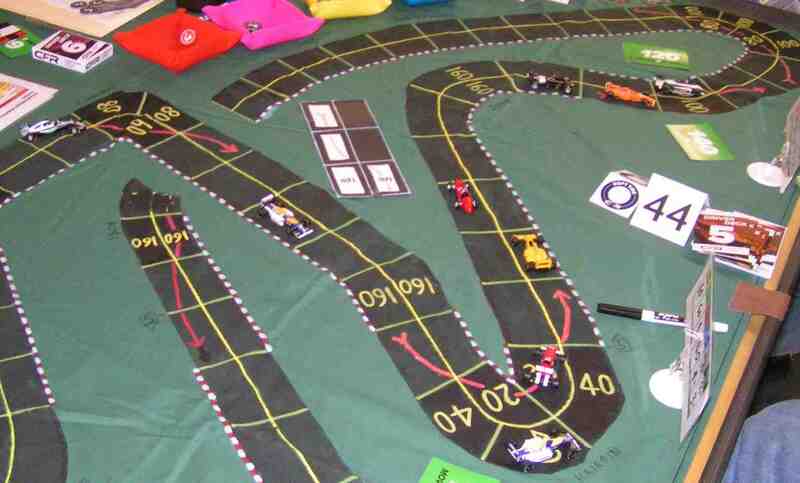 But the Ferraris were wear-deprived, and they both only went 80 mph through the chicane, leaving them both one space short of the finish line. 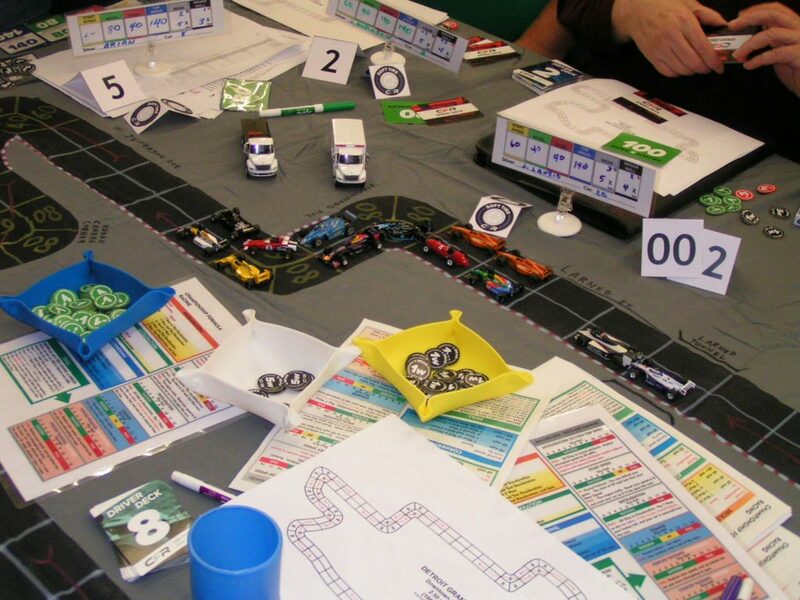 Sturgeon pushed his car to its limit, going 120 mph through the chicane, and then he pulled off a successful forced pass of the Ferraris to win the race! It was Sturgeon’s first victory of his racing career, and it was a memorable one after starting 2nd on the grid. Beckman (+1) came home in 2nd, and Kempen (+3) was 3rd. Sturgeon wins in the black Lotus after forced passing the Ferraris. The rest of the pack finished in a rather less dramatic fashion. 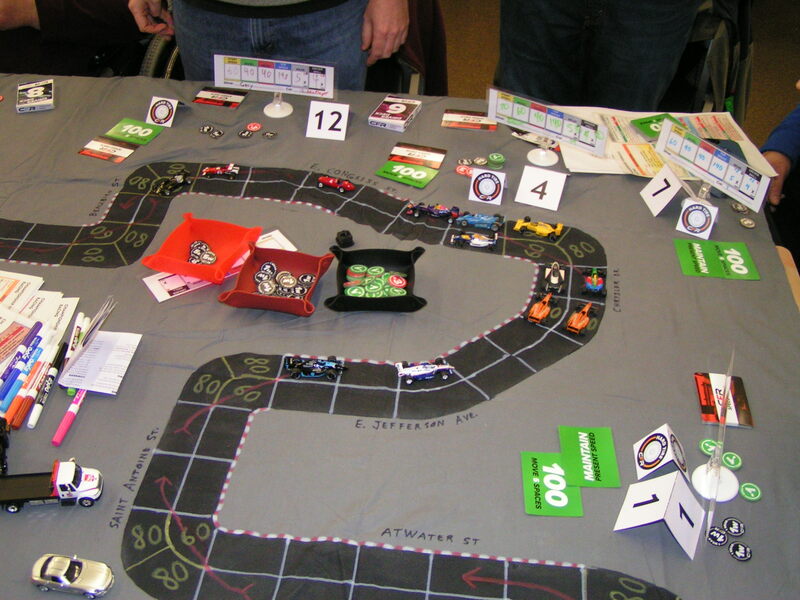 Cook (+1) took 4th, then came Manderachia (+6) in 5th, and Jim Landis (+2) was 6th, the last car to finish in the points. Finishing out of the points were: Jim Robinson (-6) 7th; Garry Kaluzny (+1) 8th; Tim Gould (+4) 9th; Brian Robinson (+2) 10th; Chad Marlett (-4) 11th; and Richard White (-2) 12th. After Richard White spun in the final chicane, it caused Greg Lim (-9) to crash. Lim was thusly classified 13th, although he was officially a DNF. 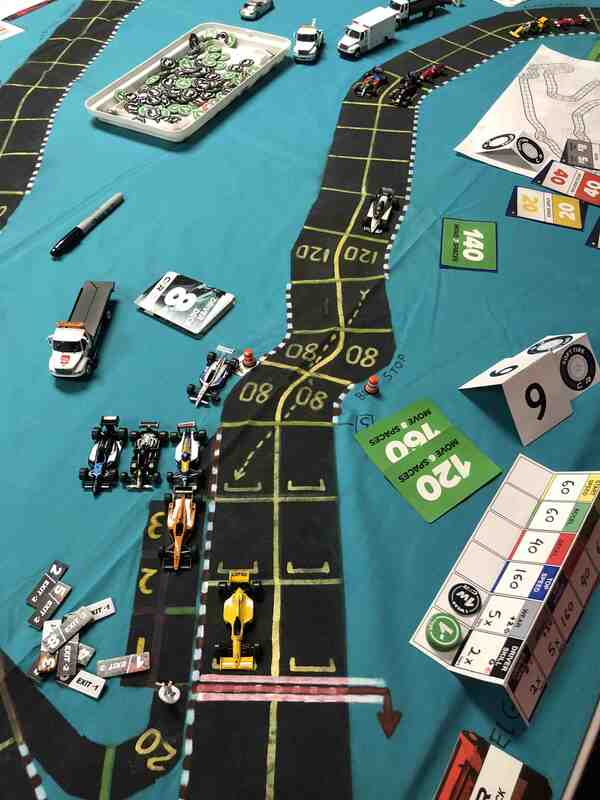 The points awarded at the Detroit Grand Prix: Sturgeon 10; Beckman 6; Kempen 4; Cook 3; Manderachia 2; and Landis 1. The 6th race of the CFR-Detroit racing season will take place on Friday, February 9, 2018, at Guild of Blades at 774 E. 14 Mile Rd., Clawson, Michigan. The race will start at 7:00 pm sharp! 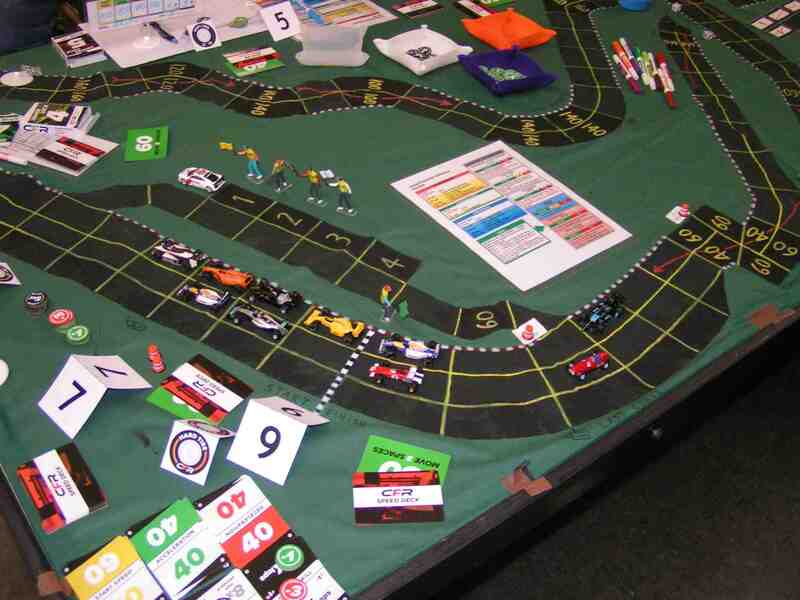 So drivers should be there by 6:30 pm to settle in and to set up their car’s specifications for the race. We didn’t start the Detroit G.P. 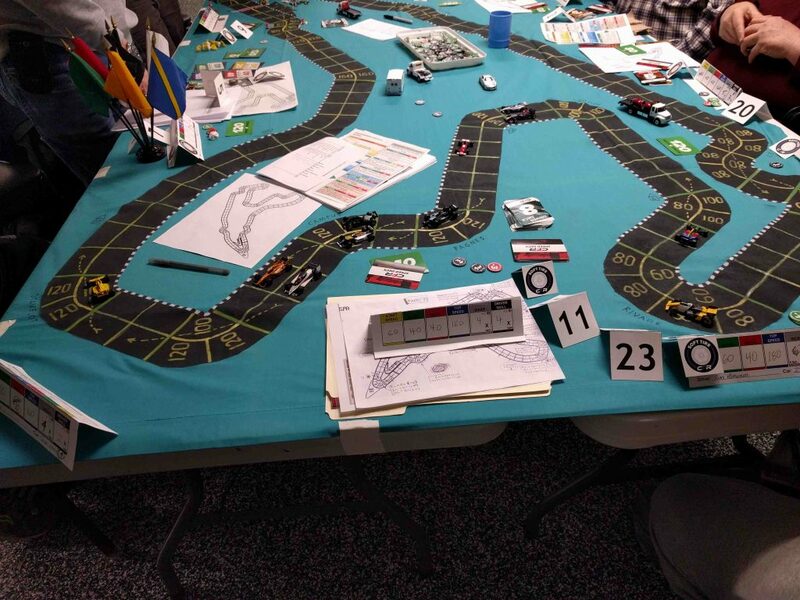 until 7:42 pm, and we had a difficult time getting the race’s three laps completed before the 11:00 pm closing time of RIW Hobbies & Games. It should be noted that Guild of Blades also has an 11:00 pm closing time, which is why we must start exactly on time, especially since we had 13 drivers at the race. Tags: Advanced Speed Circuit, Atwater St., Avalon Hill, Beaubien St., Benetton, Brabham, Brian Robinson, Camel Lotus, CFR, Chad Marlett, Championship Formula Racing, Chrysler Drive, Clawson, Cobo Center, Cobo Hall, Detroit Grand Prix, E. Congress St., E. Jefferson Ave., Ferrari, Ford Corner, Garry Kaluzny, Gary Kempen, Gary Sturgeon, Goodyear Tunnel, Greg Lim, Guild of Blades, Jack Beckman, Jim Landis, Jim Robinson, John Player Lotus, Kodak Camera Corner, Larned St., Ligier, Livonia, McLaren, Michigan, Mike Cook, Mike Manderachia, Motorola, Pontchartrain Hotel, Red Bull, Richard White, RIW Hobbies & Games, Speed Circuit, Tim Gould, W. Jefferson Ave., Walker Racing, Washington Blvd., Williams, Woodward Ave.